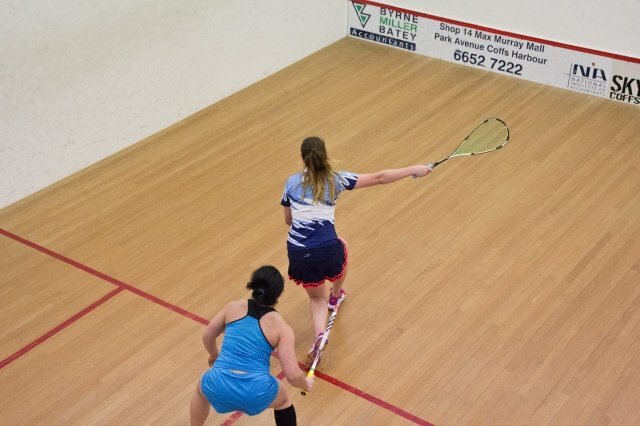 The Graded program of events produced some great contests especially in the Men’s State Grade and A Grade with the ladies , some who travelled long distances and made new friendships along the way enjoying a fantastic 4 days of play. 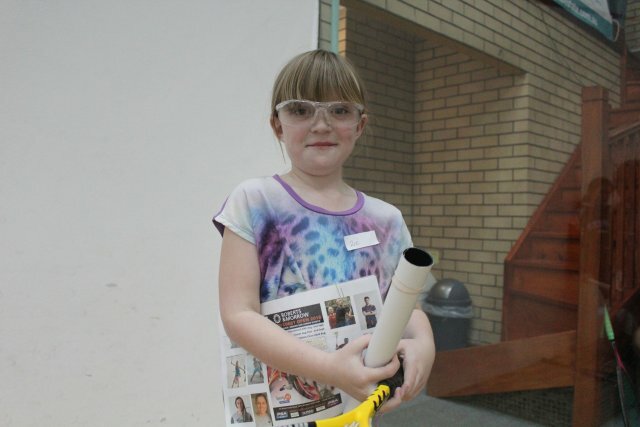 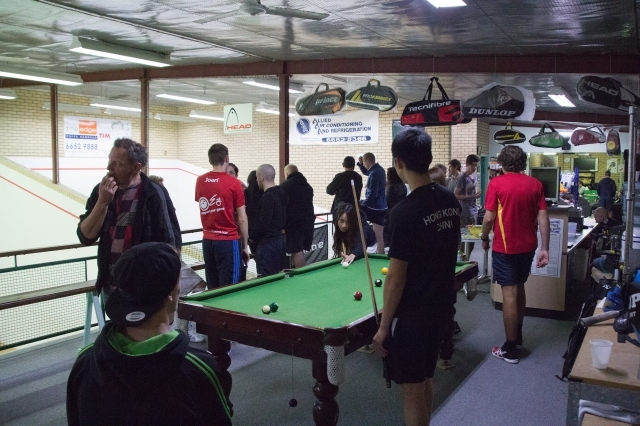 Players from the North West area of Glen Innes were among new visitors joining the competition. 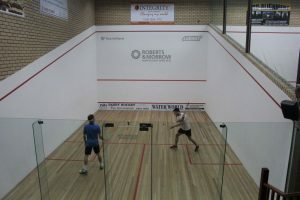 Congratulations to Melissa Elliott for a great win in five games against local Jacqui Gardner in the Ladies B Division. 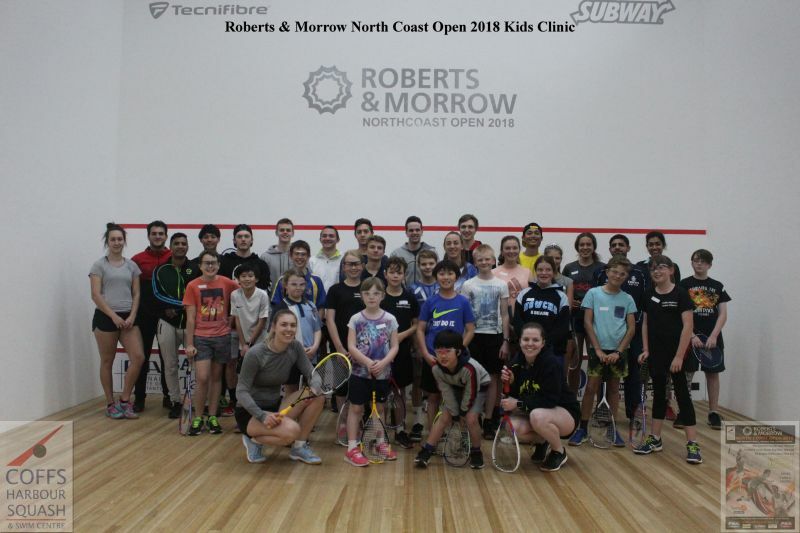 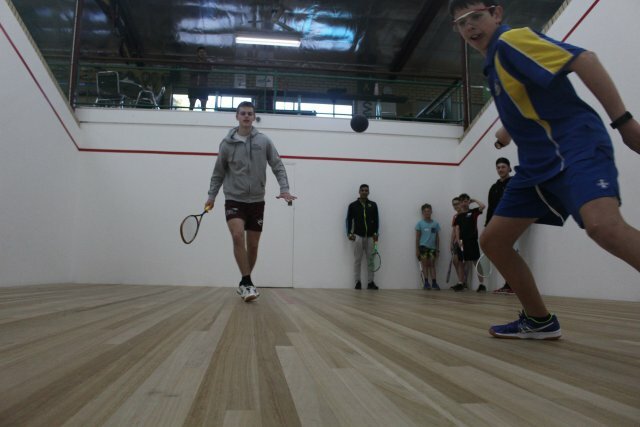 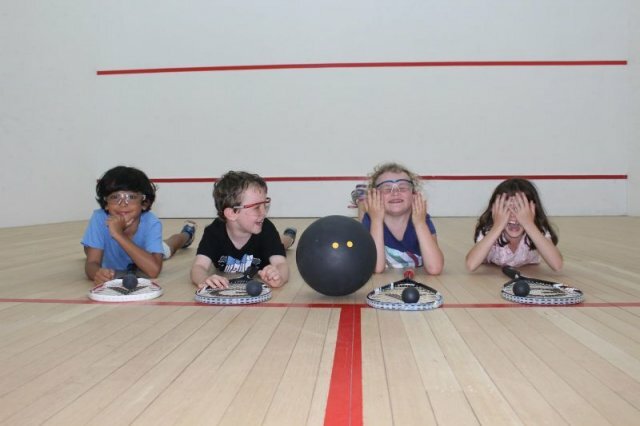 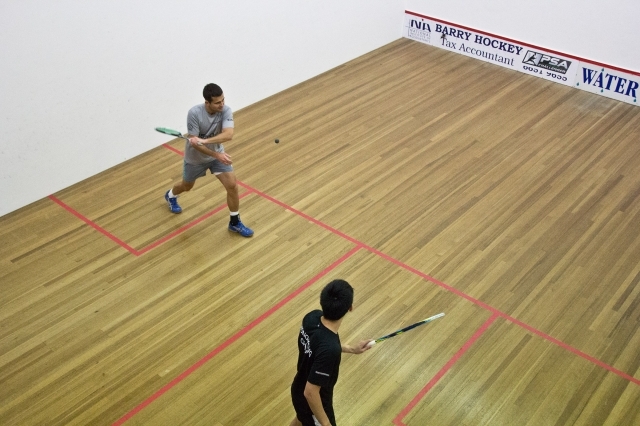 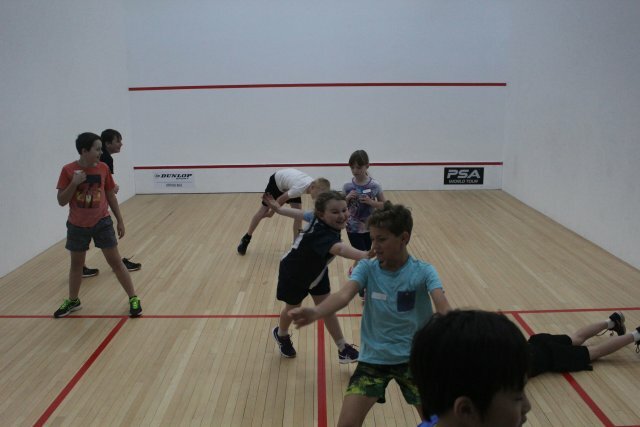 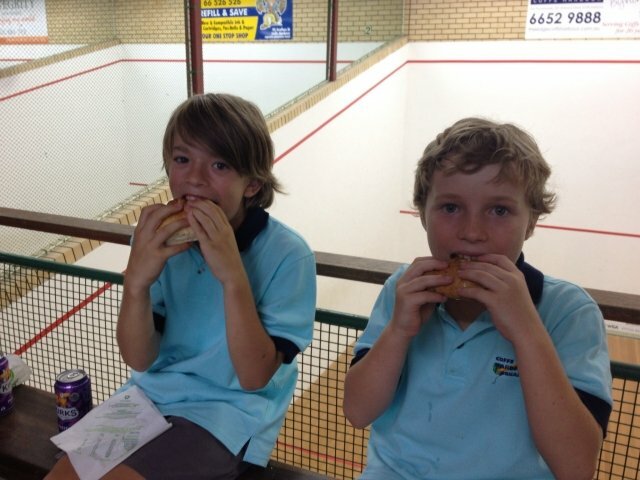 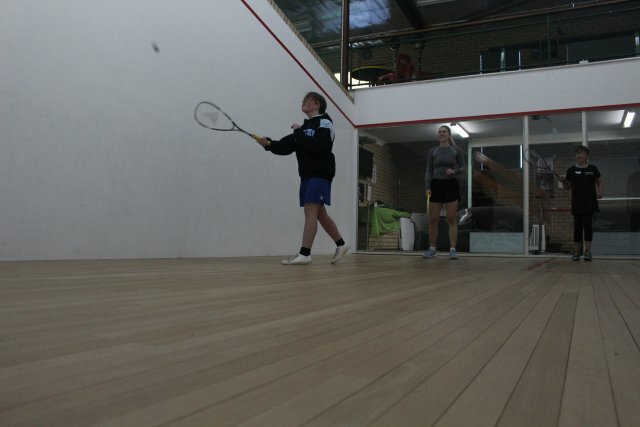 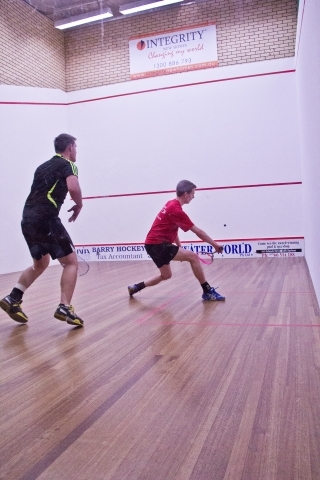 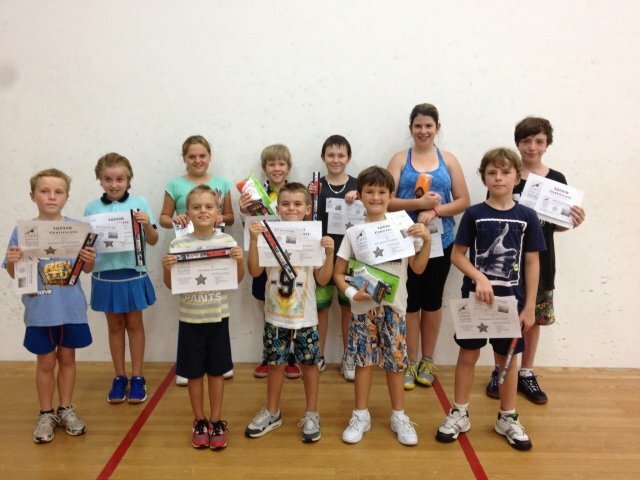 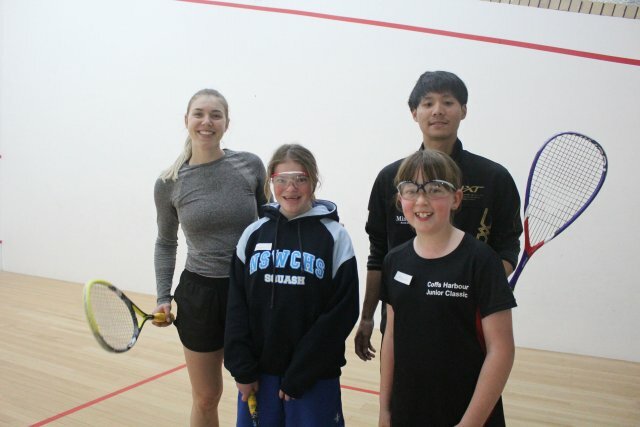 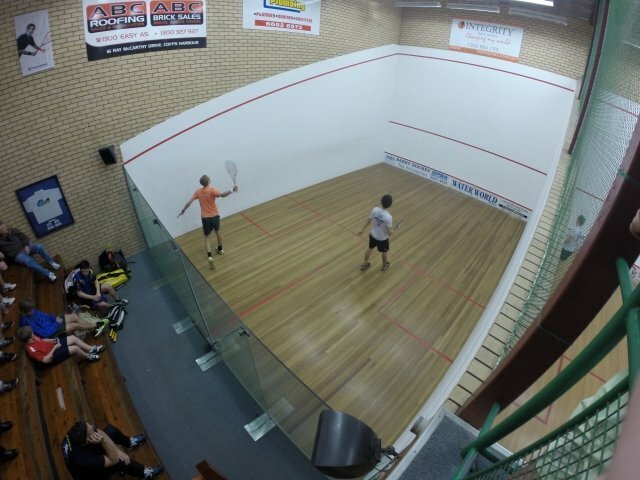 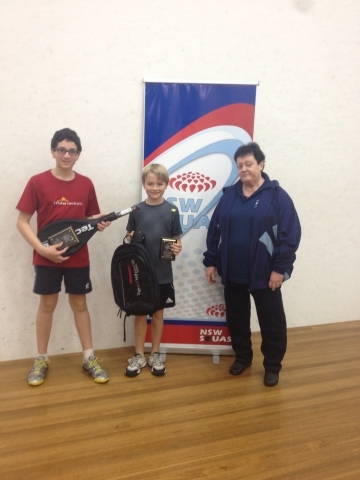 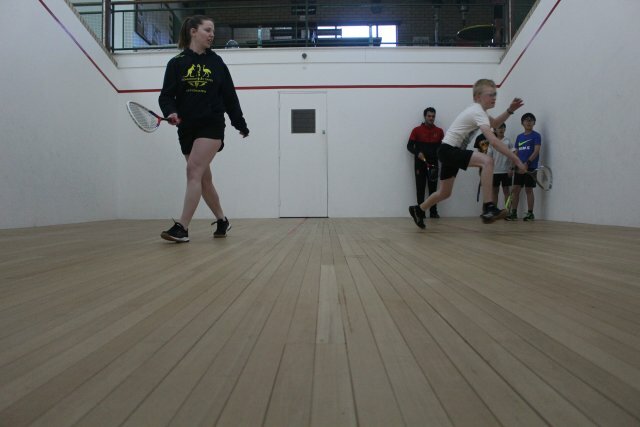 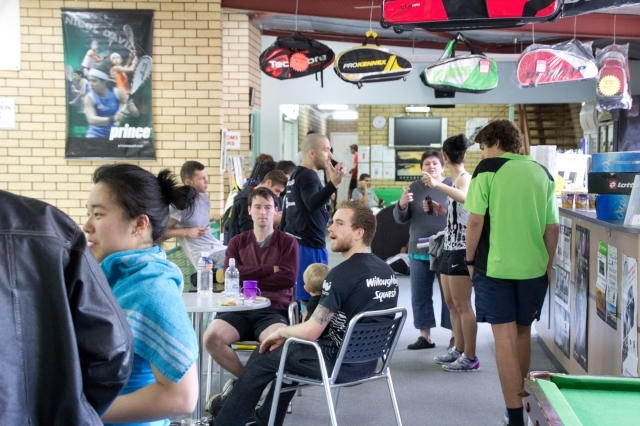 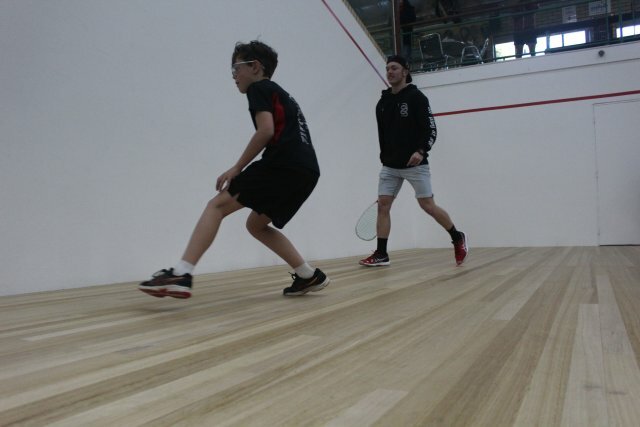 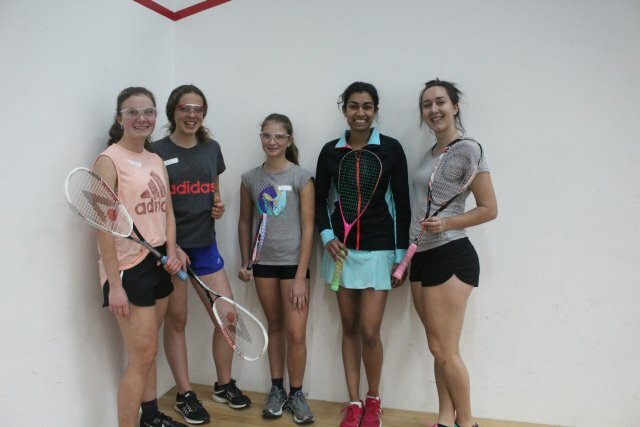 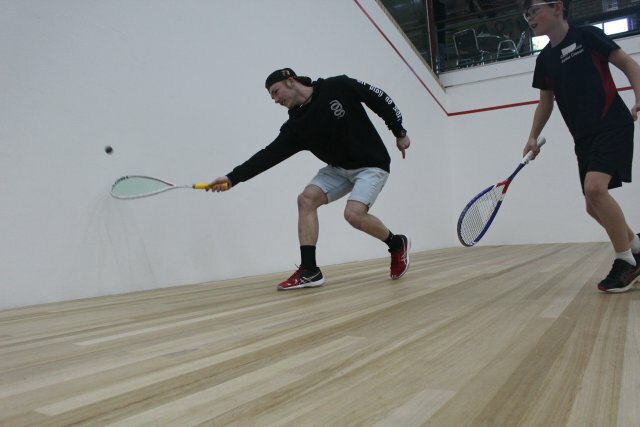 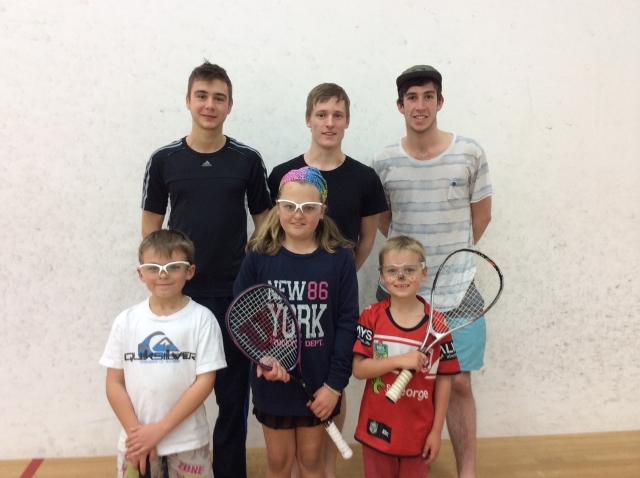 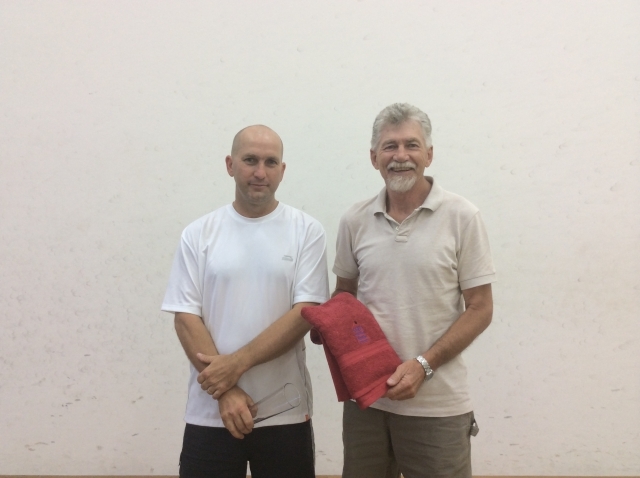 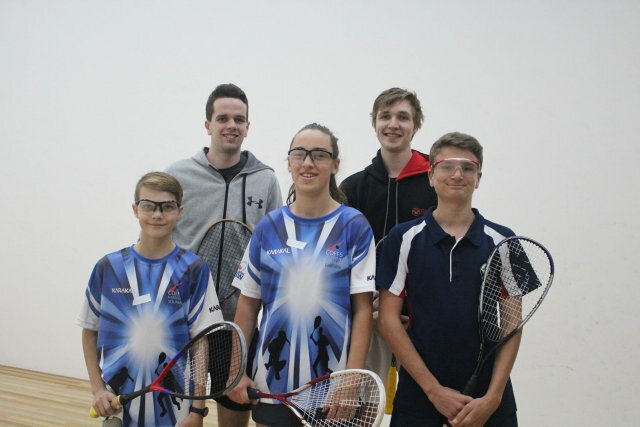 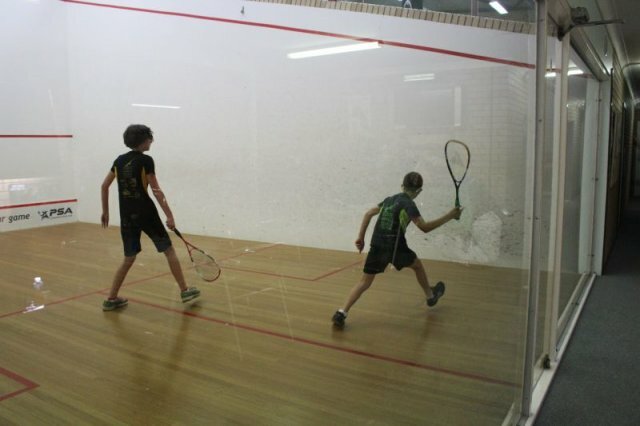 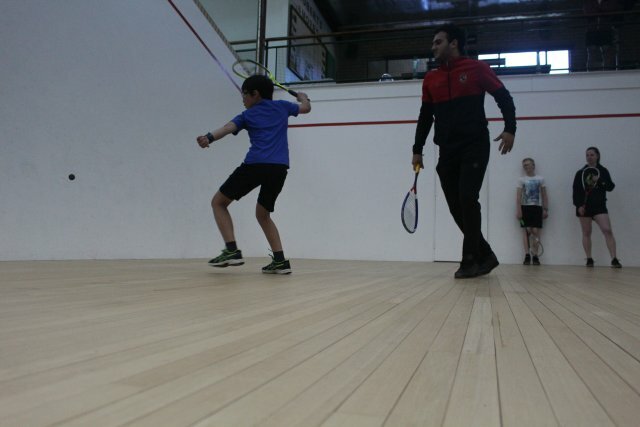 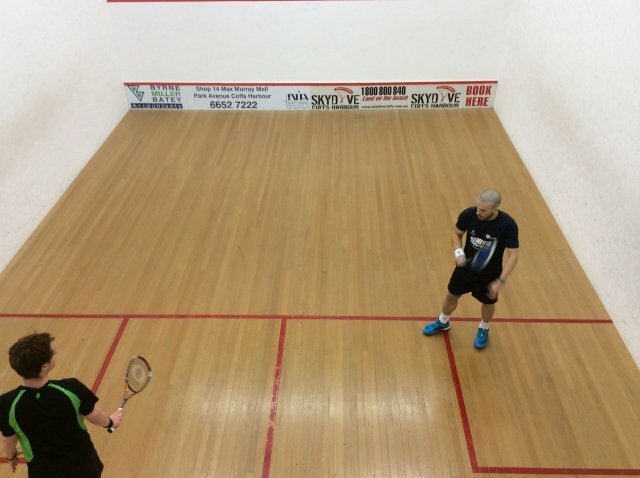 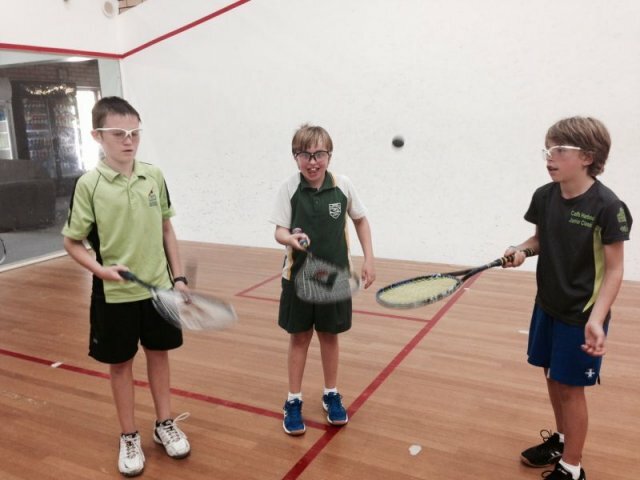 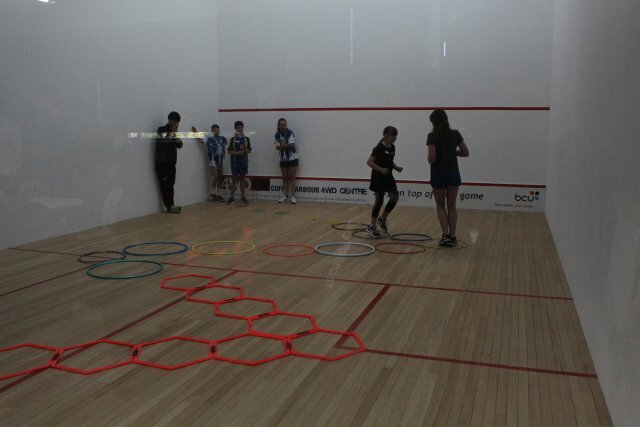 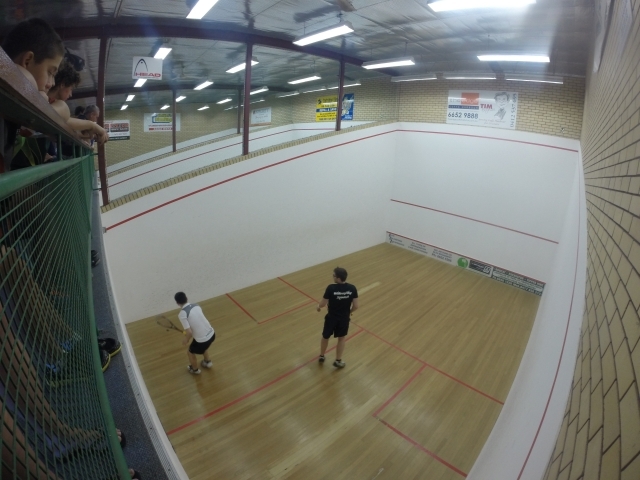 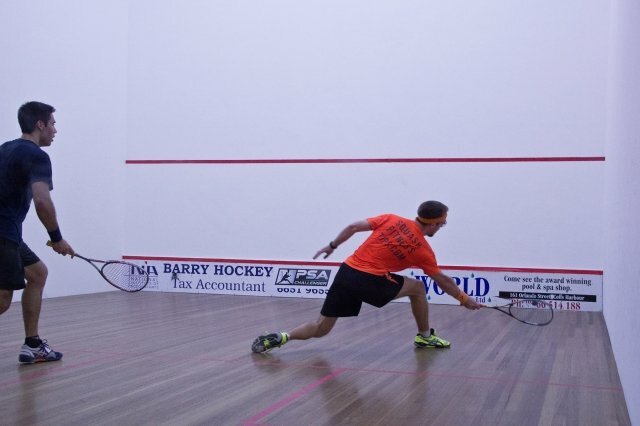 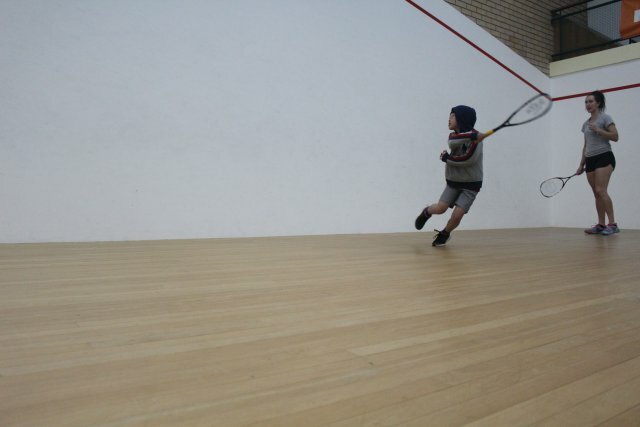 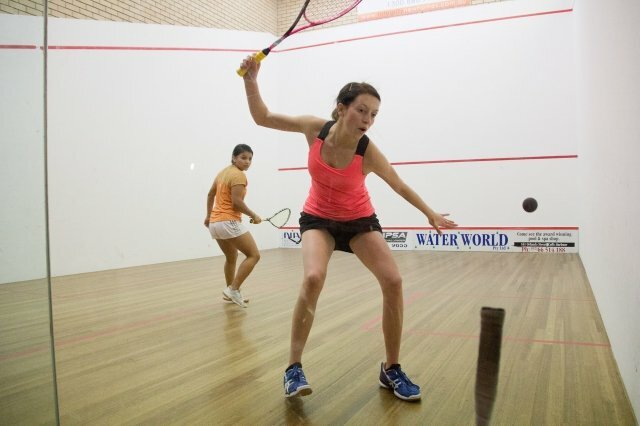 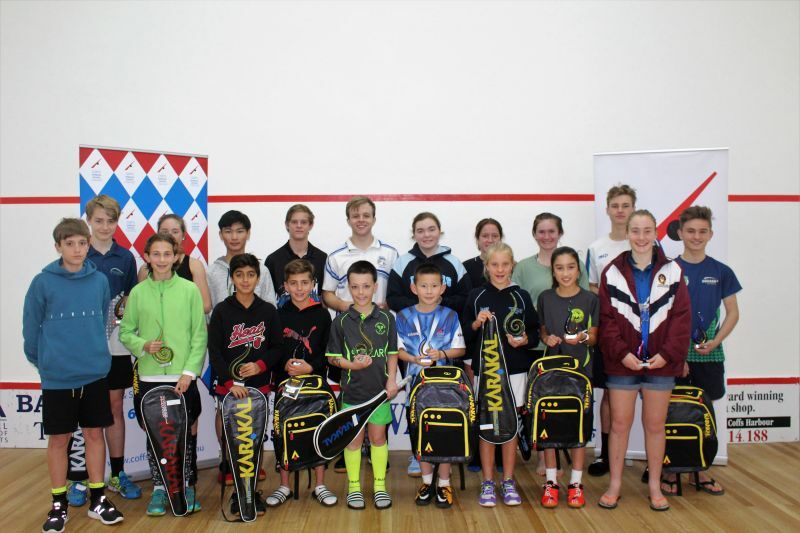 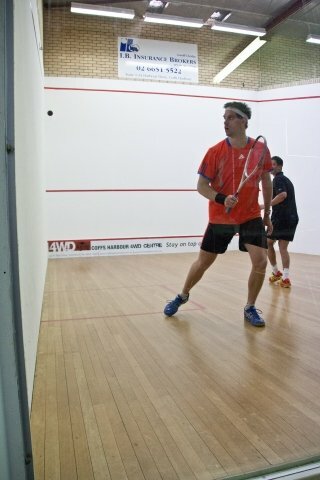 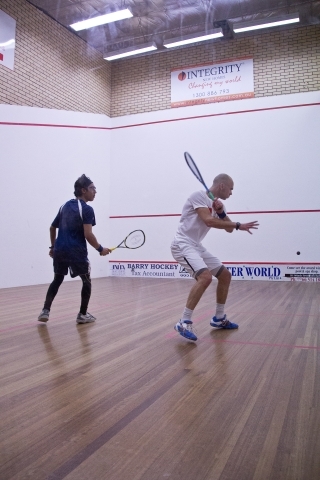 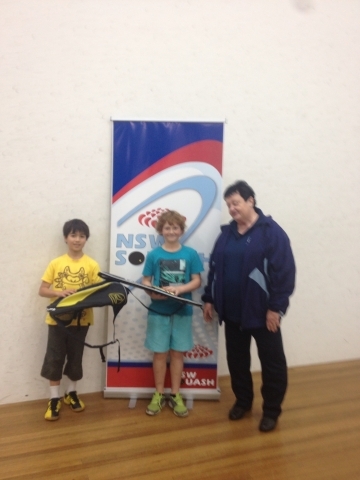 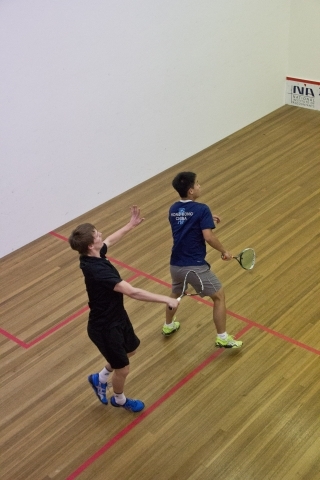 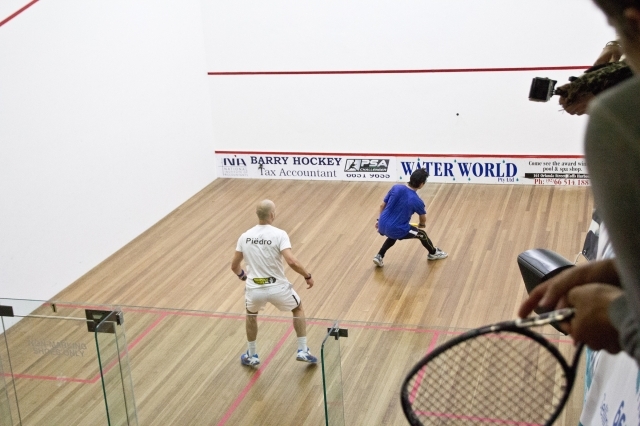 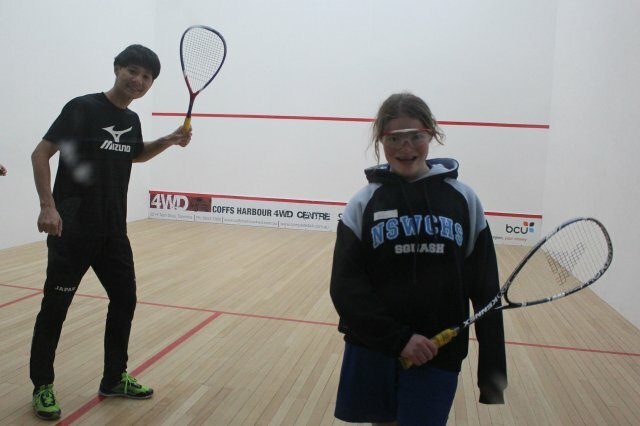 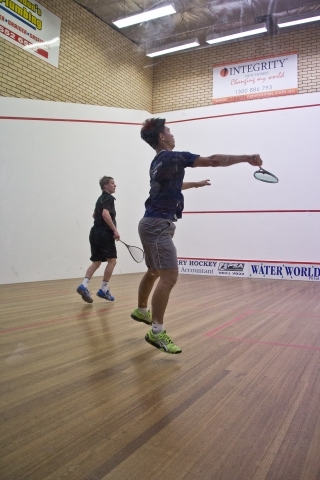 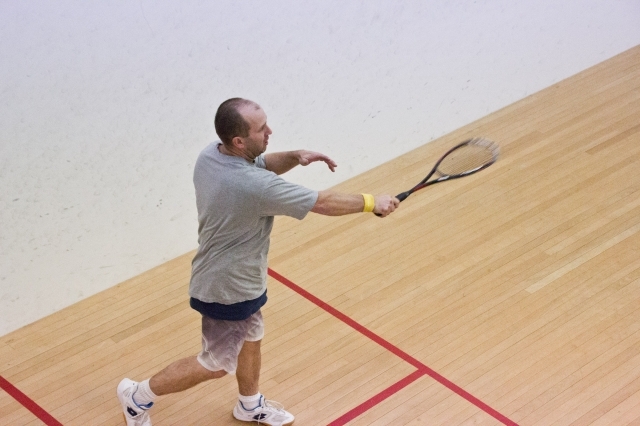 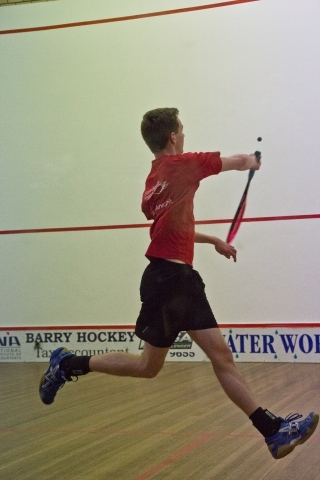 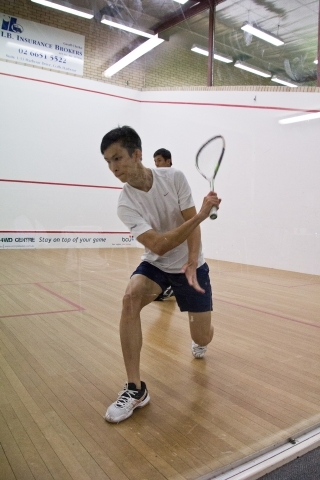 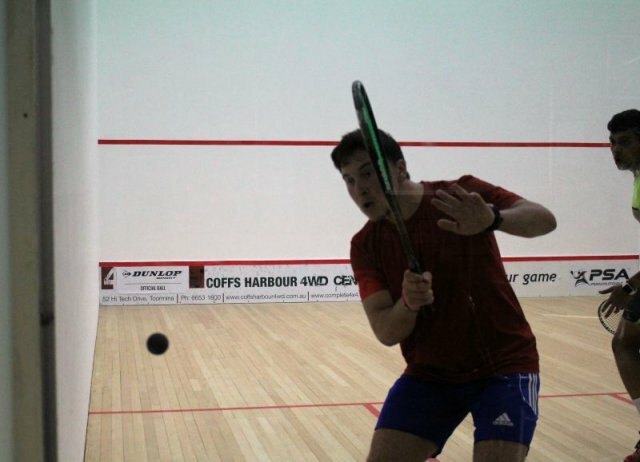 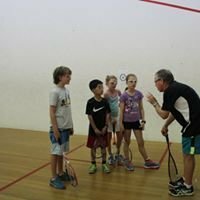 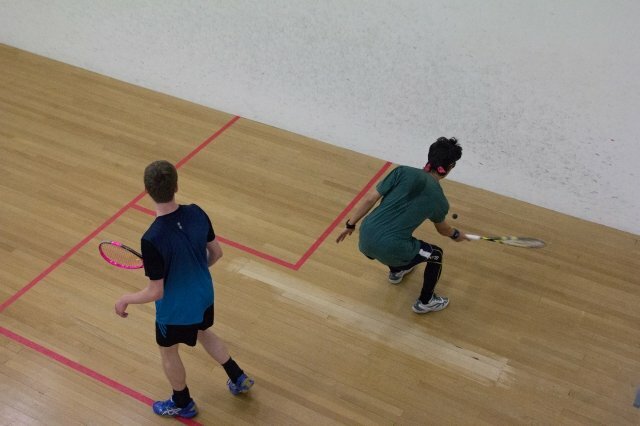 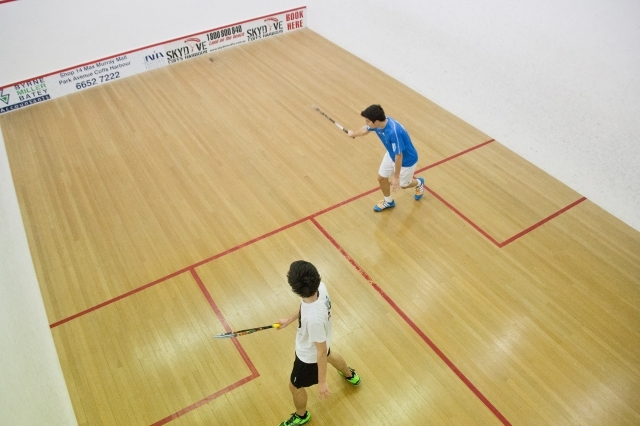 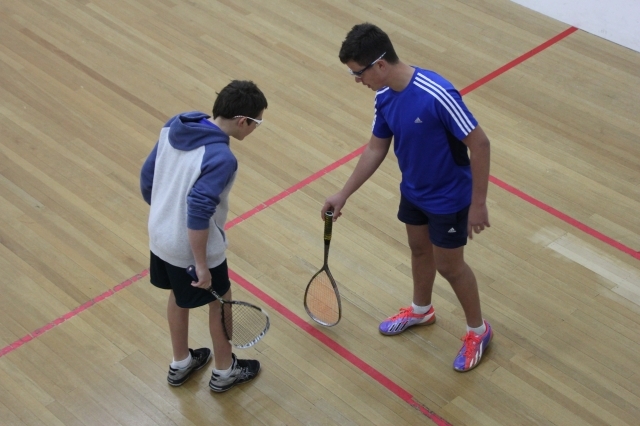 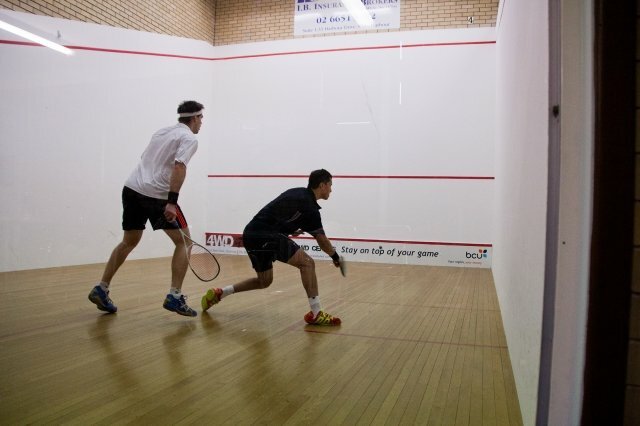 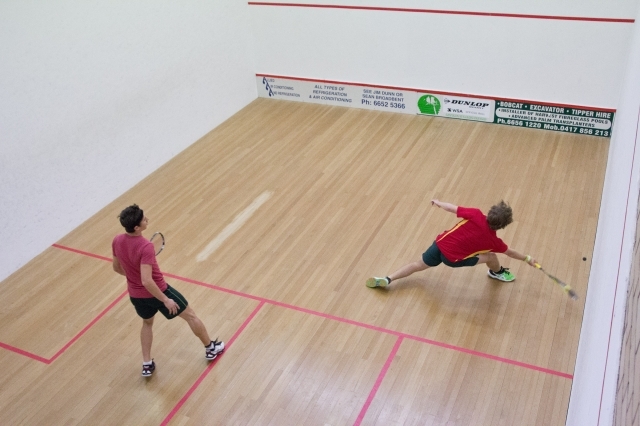 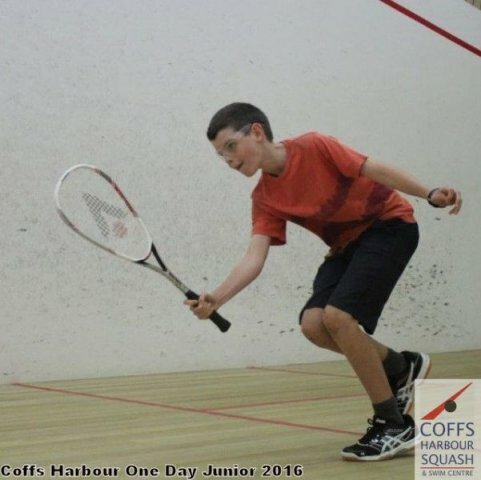 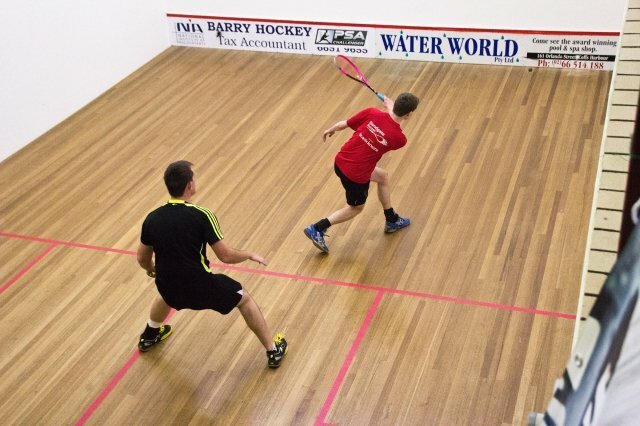 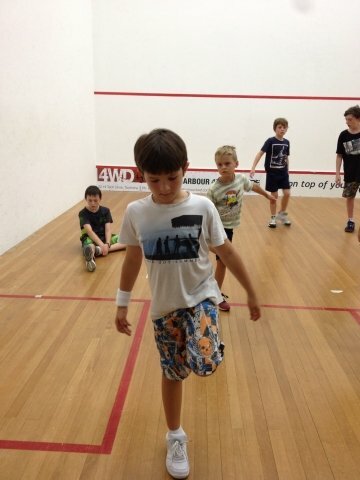 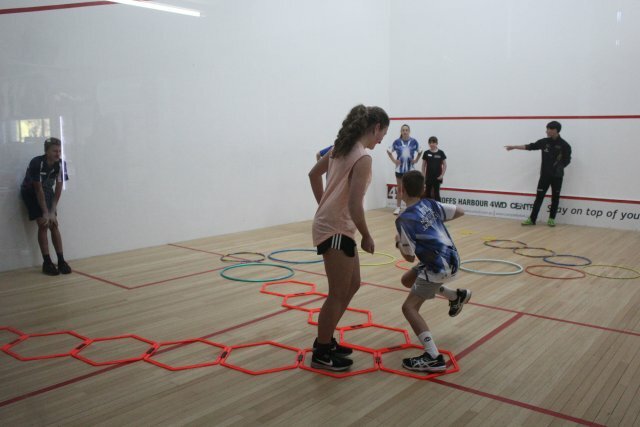 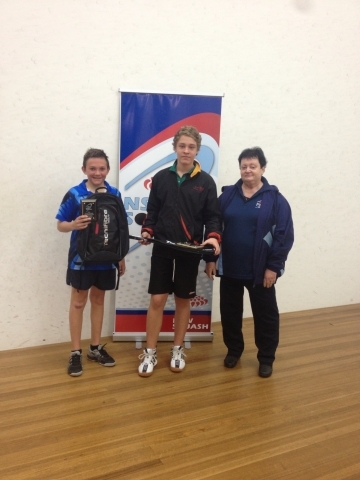 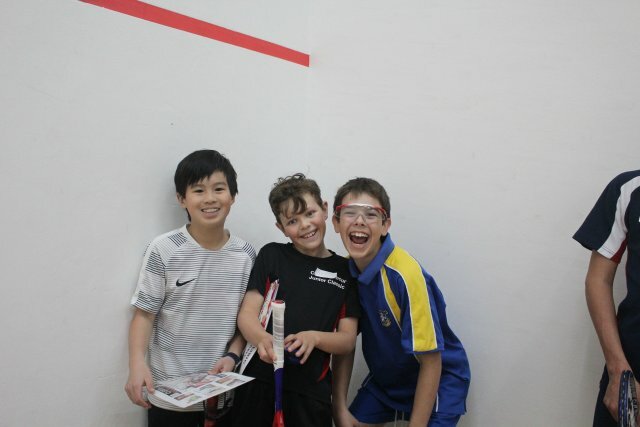 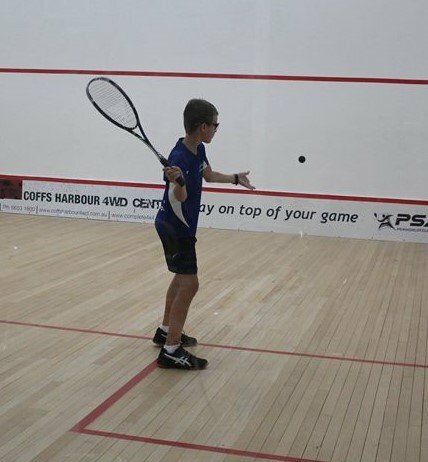 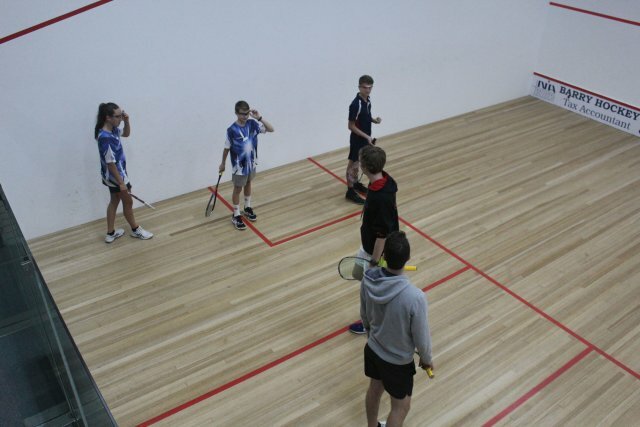 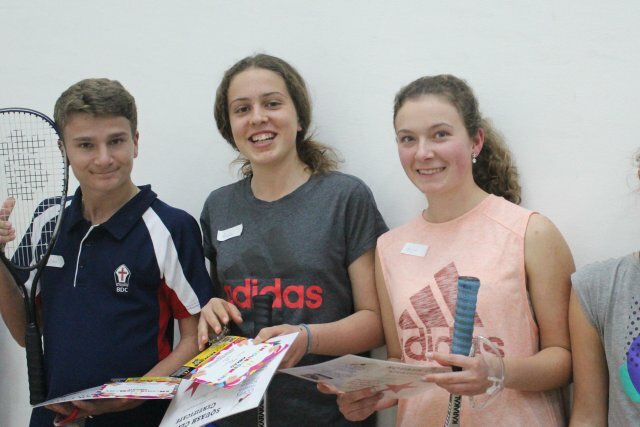 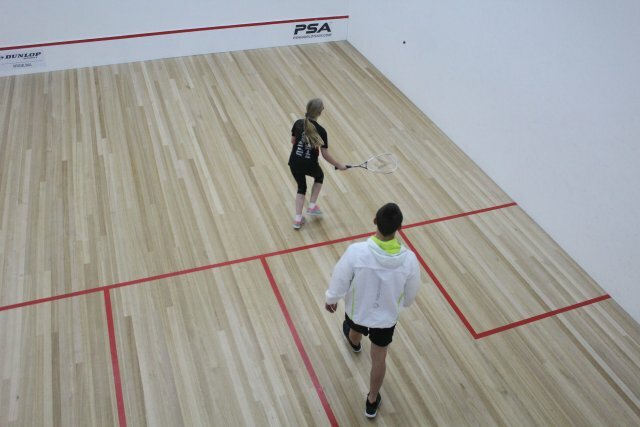 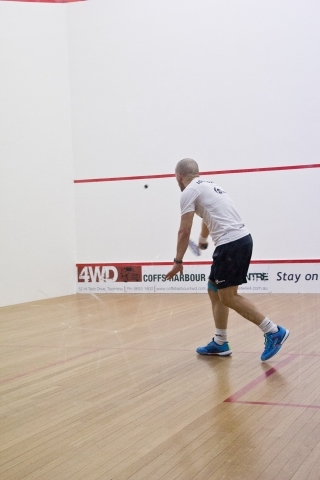 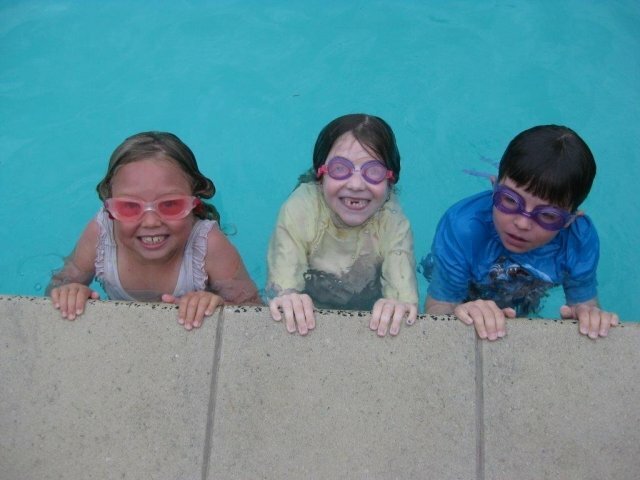 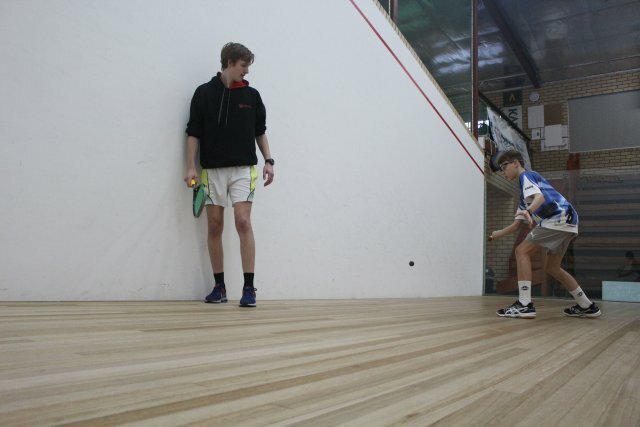 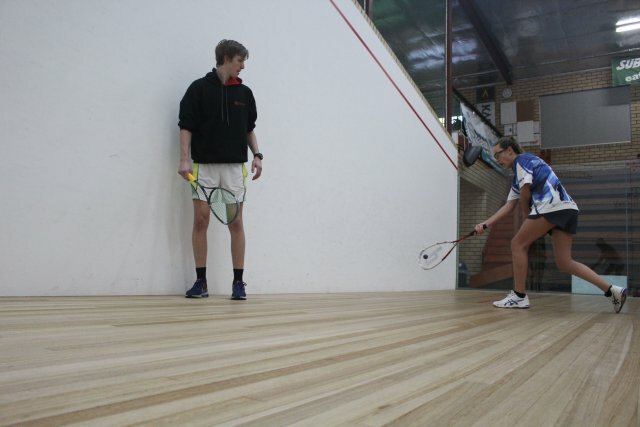 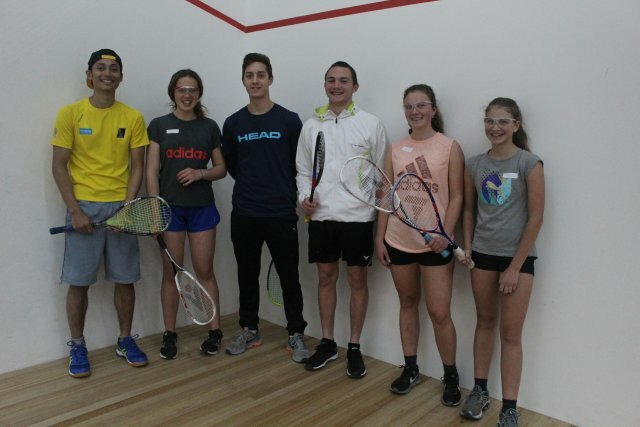 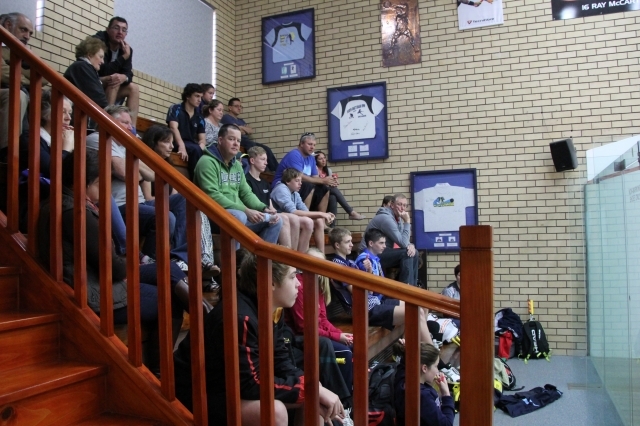 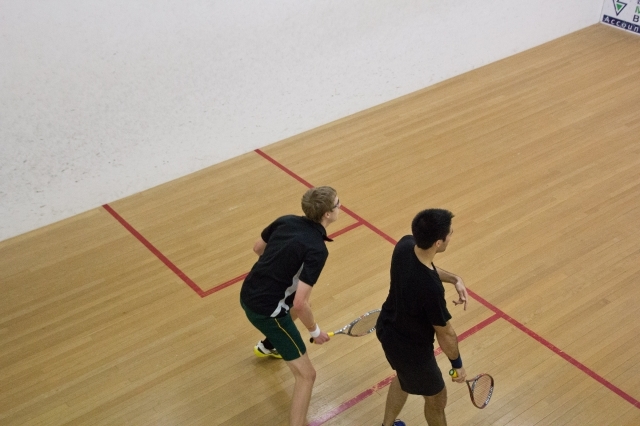 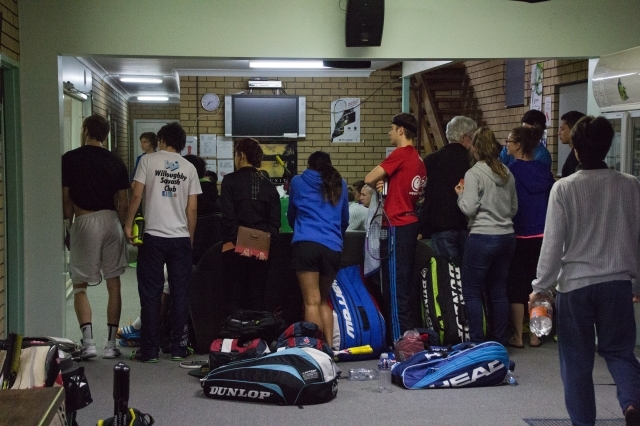 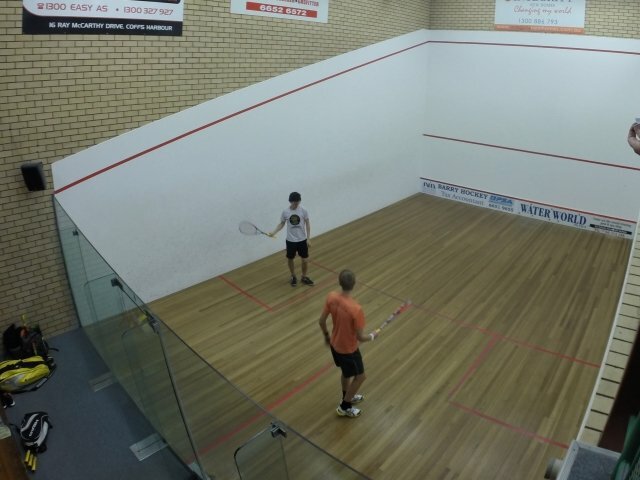 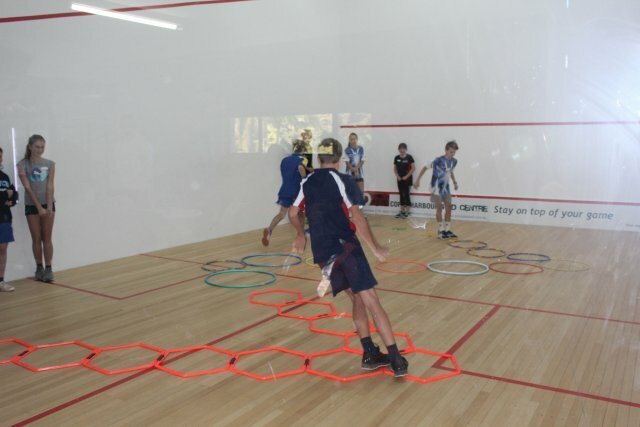 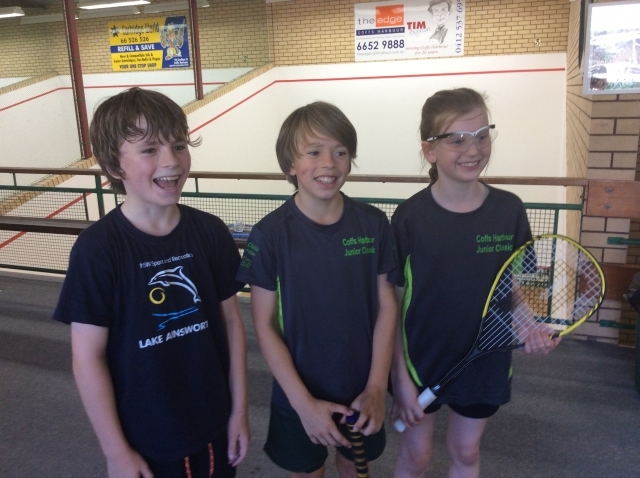 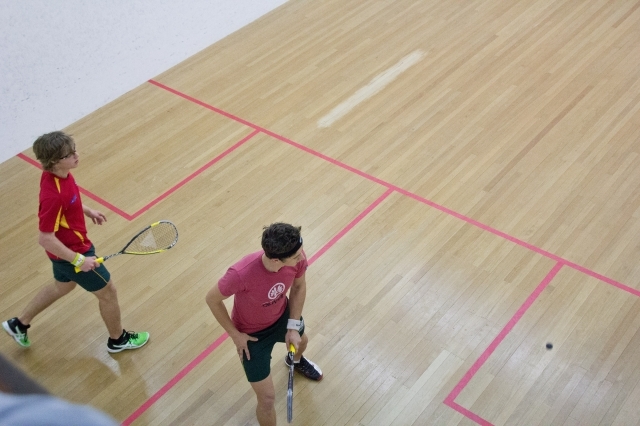 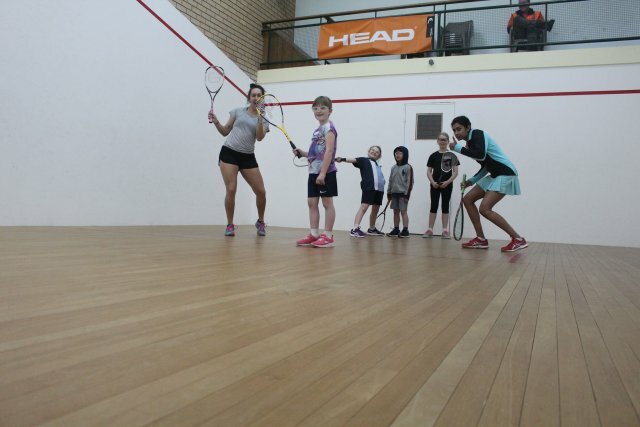 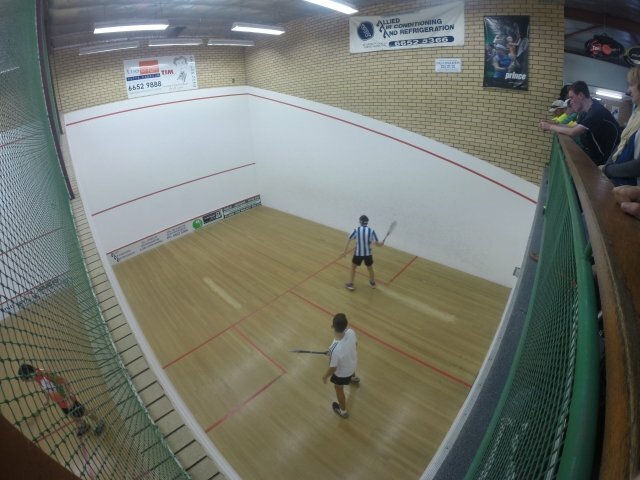 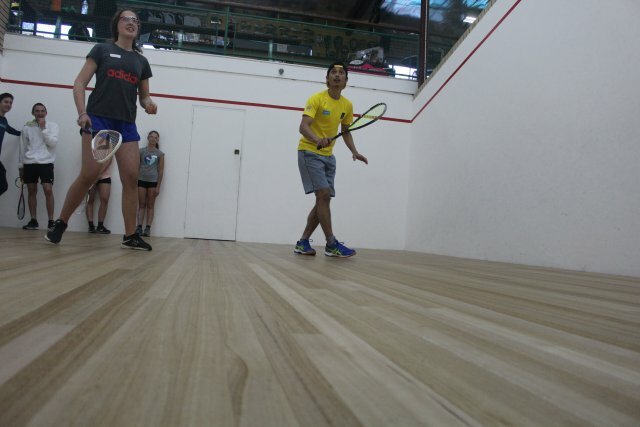 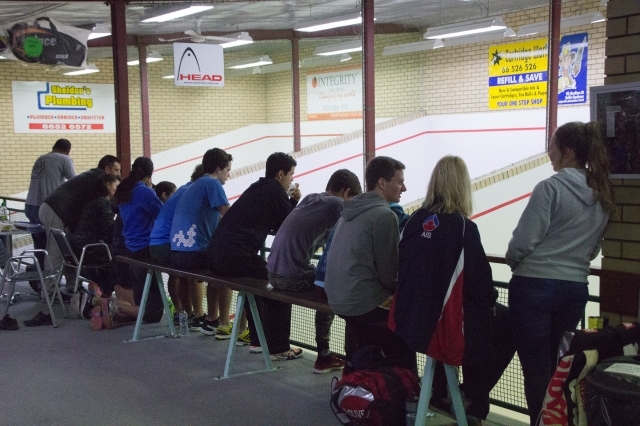 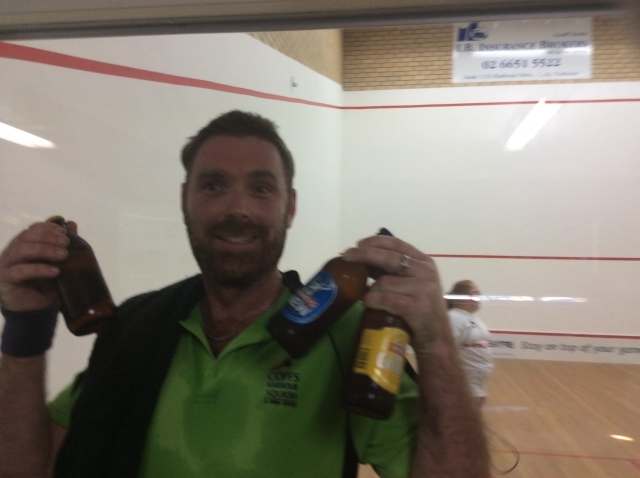 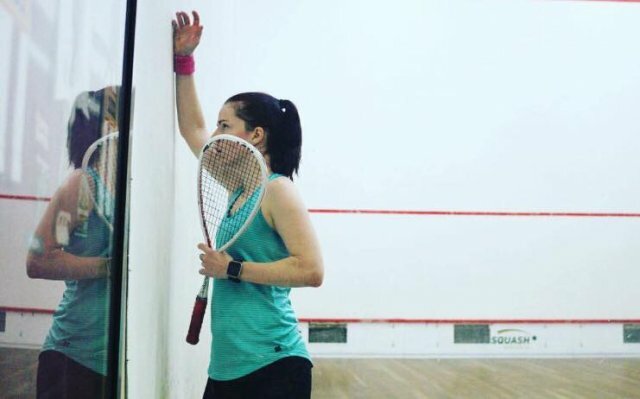 Players from the Central Coast, Newcastle and Hunter region joined in for a relaxed weekend and plenty of squash. 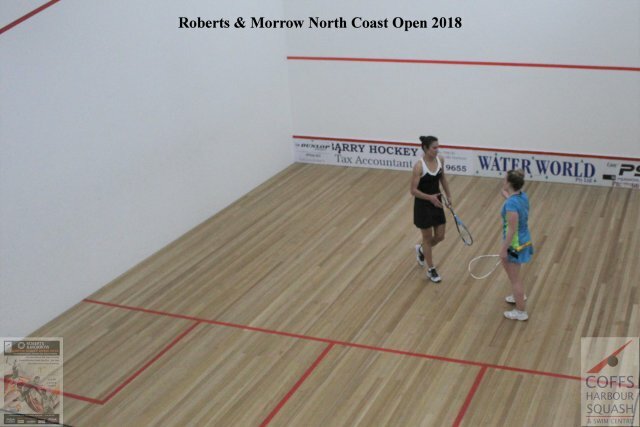 To the north, players from Brisbane to Caboolture and Gold Coast all put in some hard performances on and off court with most making it on time each day for the early start of 9.00am. 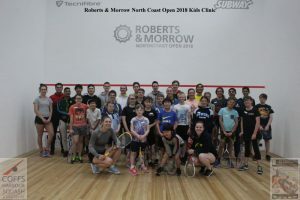 The Junior Clinic on Thursday afternoon attracted 26 juniors who thoroughly enjoyed getting on court with the Open players and playing some fun games. 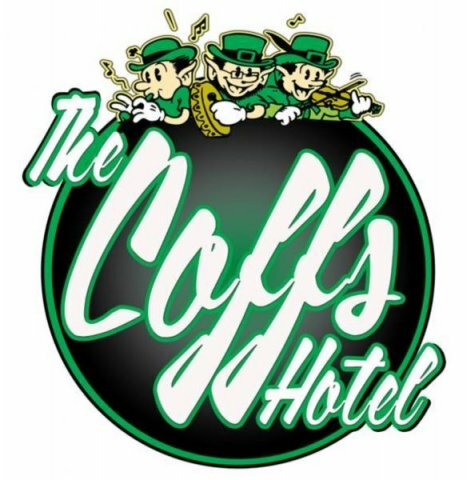 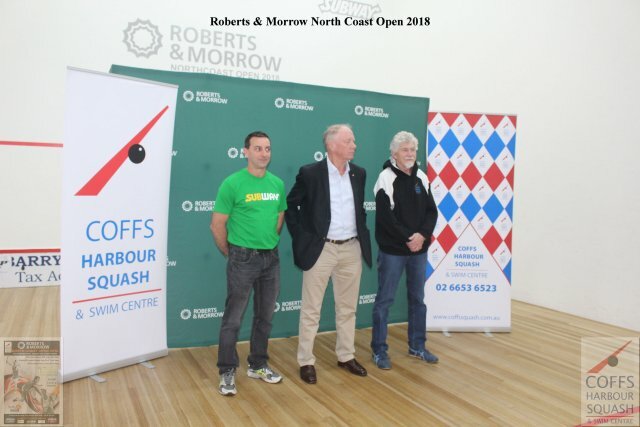 On Friday night Denise Knight Mayor of Coffs Harbour officially welcomed our international visitors and traveller’s to the city wishing players a successful event and take the opportunity to see the attractions of the Coffs Coast while here. 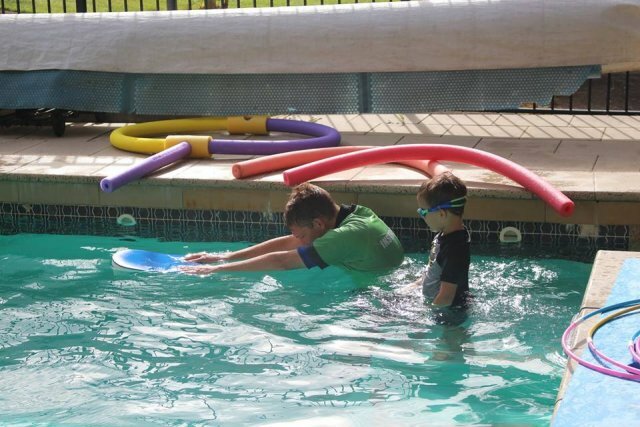 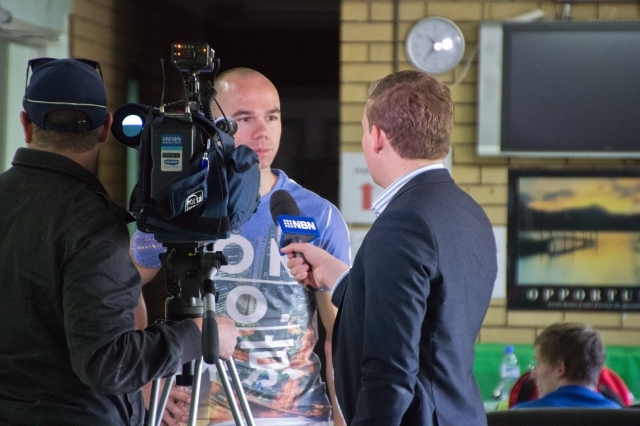 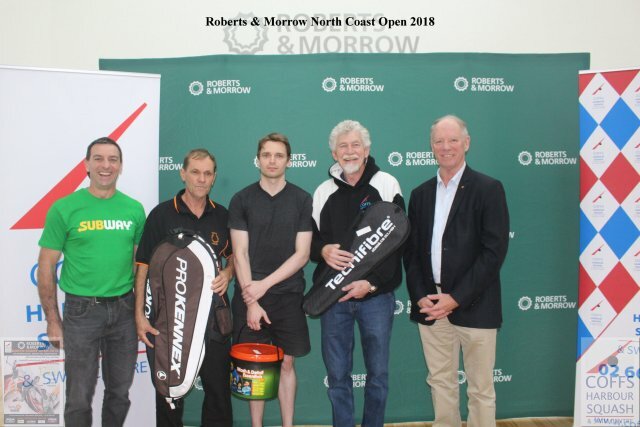 The event received wide media coverage with ABC Sports, NBN and Prime TV covering the event and our Livestream coverage, Sportyhq live scoring and facebook coverage put together by Jemma Wratten. 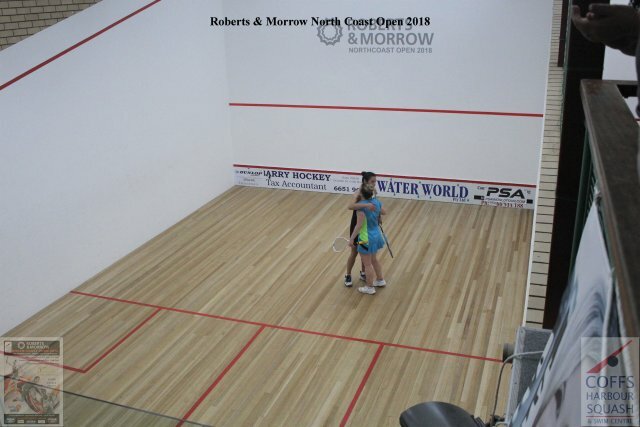 It was very pleasing to receive acknowledgements from the players and visitors on the facility appearance and outstanding court surfaces for the players. 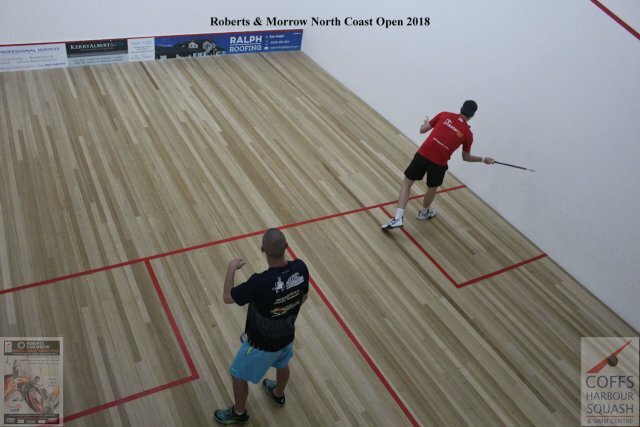 Show court 1 looked spectacular with the addition of front wall Sponsors adding to the spectacle of hosting a Qualification Event for the World Championships here in Coffs Harbour and one of 7 events worldwide. 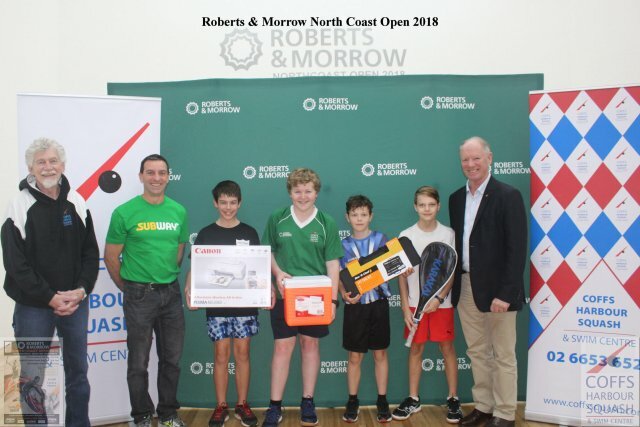 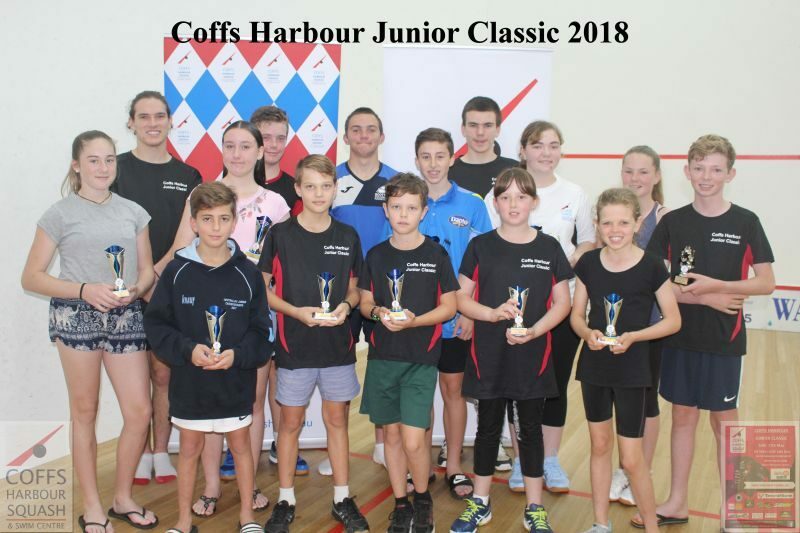 To wrap up the Finals Day, it was great to have Andrew Fraser MP for Coffs Harbour join us for Sunday’s finals and see some world class action and present prizes to the winners at the presentations. 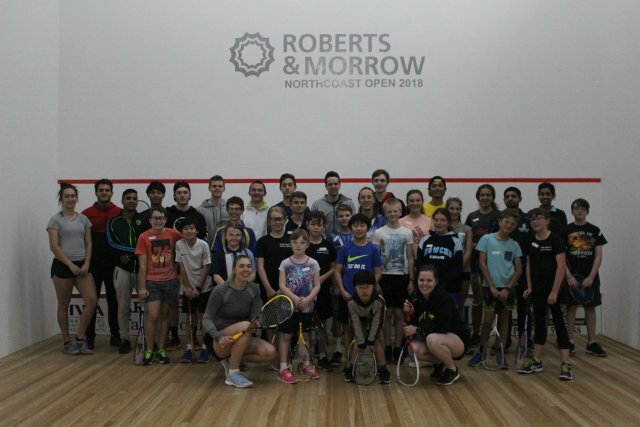 The tournament was a great success and could not have been achieved without the support of volunteer staff who helped in the kitchen and customer service. 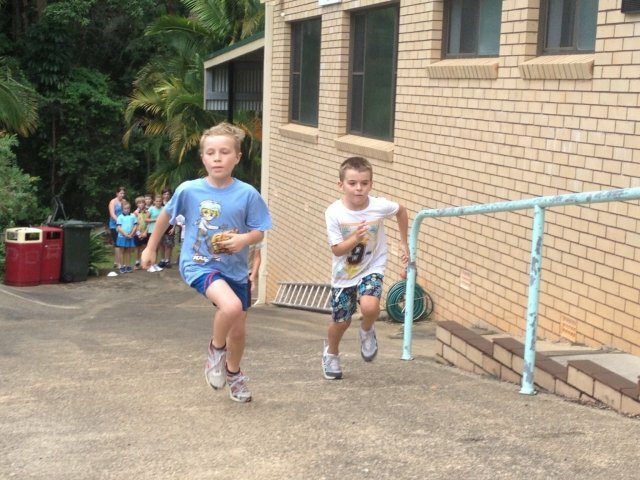 Our juniors took on all the small tasks and did a great job. 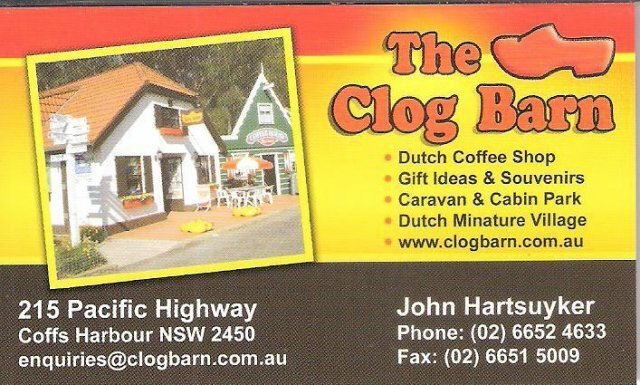 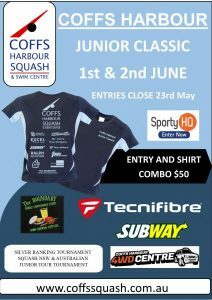 Our sponsors deserve a special mention for without their support we would not be able to bring an event of this category to Coffs Harbour. 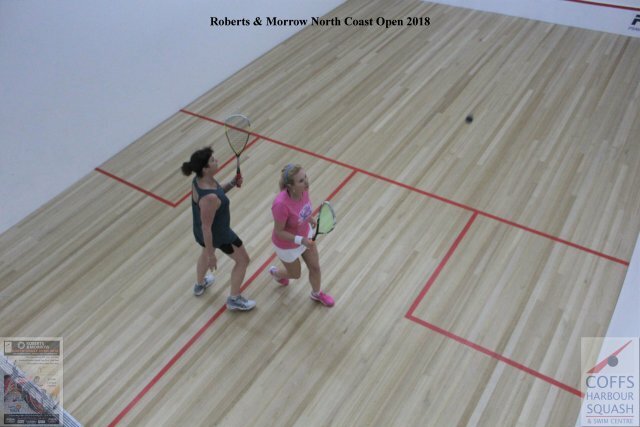 The 2018 finals were played out before a packed gallery with finalists (1) Christine Nunn Australia and (2) Sarah Cardwell Australia seeking the all- important win for a spot in the World Championships 2019. 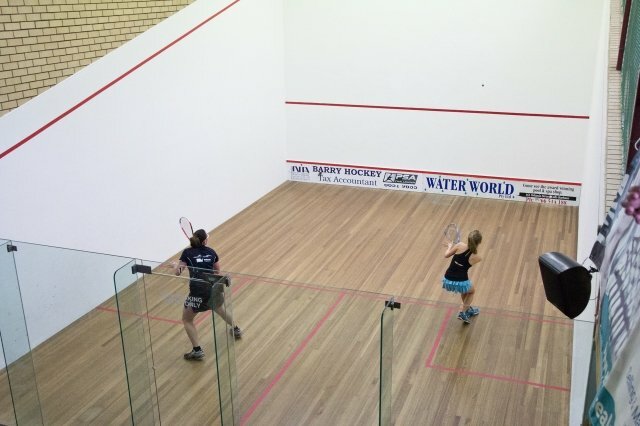 The match started with both players looking to settle in and lengthen the rallies. 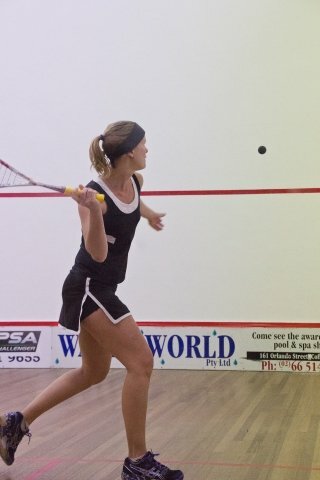 This suited Sarah early as she jumped out to lead in the opening game but the tenacity of Christine showed through as she came from behind to steal the opening game. 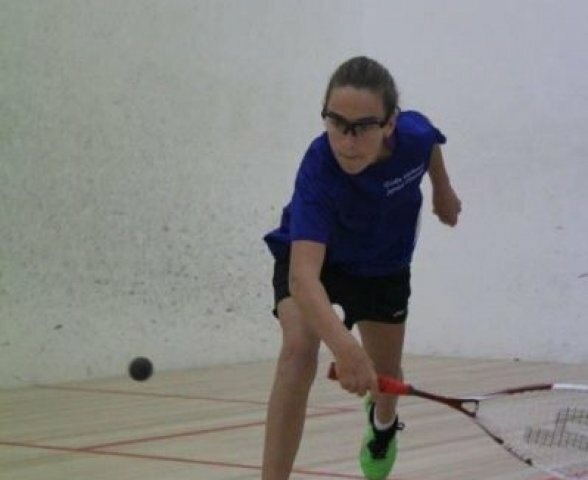 A similar start in the second saw Sarah have her chances but Christine again produced error free rallies to draw level and take the second game to go two game up. 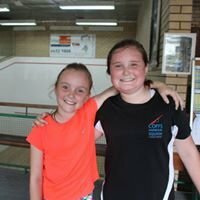 Christine looked to have the upper hand at the start of the third but a courageous fightback by Sarah where she strung together well placed short balls to the forehand court and she found herself back in the match taking the third and fourth games and appeared to gaining confidence as a result. 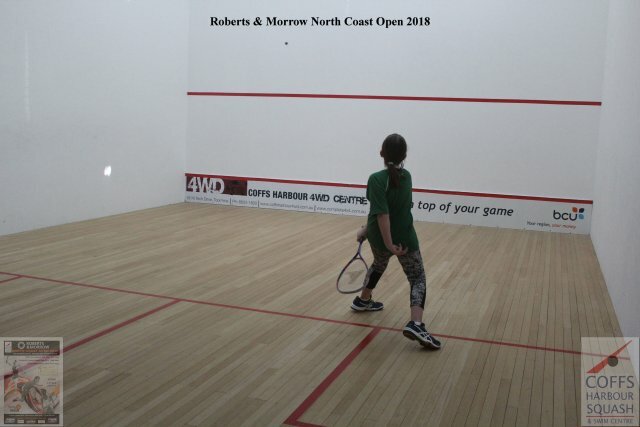 In the final game both girls traded volleys and used the corners looking to create a slender opening and at 7-5 Christine won two points well directed to the forehand clinch the match in five games. 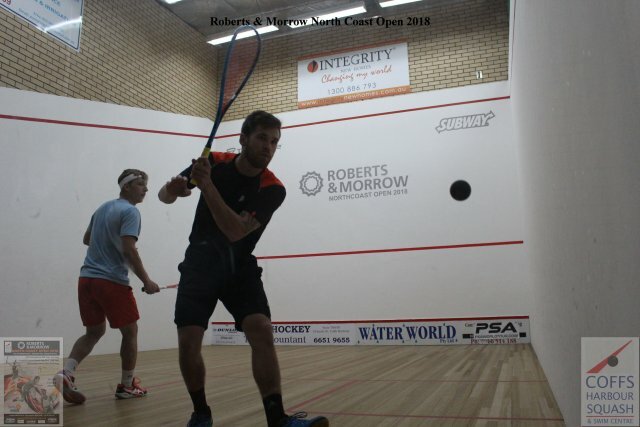 The Men’s final opened at a hectic pace with Evan Williams looking to be in command early before Dimitri worked the ball short to the backhand and closed the gap. 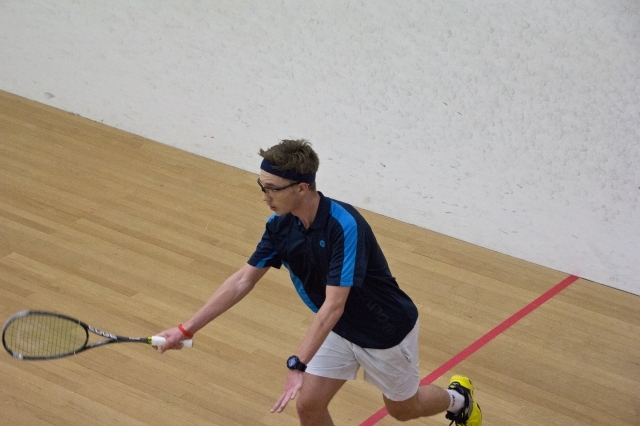 Evan looked like he had squandered the lead as Dimitri drew level at 10-10 and with a couple of close calls managed to win the tie break and go one up. 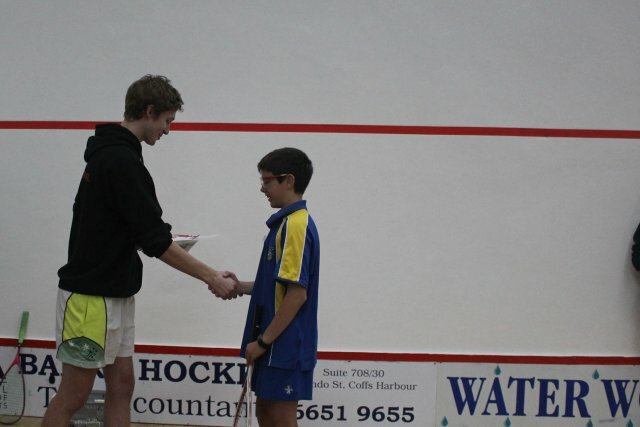 Dimitri opened the second game with a change in pace and movement to making Evan move to the front court each rally. 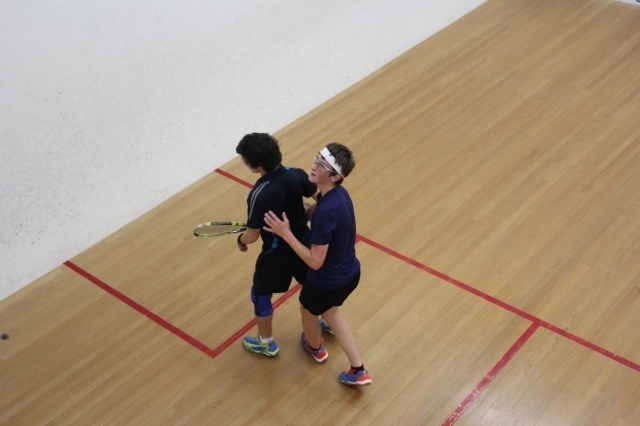 Evan’s returns under pressure resulted in unforced errors for Dimitri to level the games at 1-1. 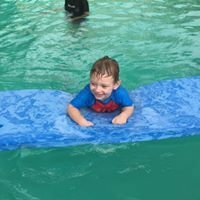 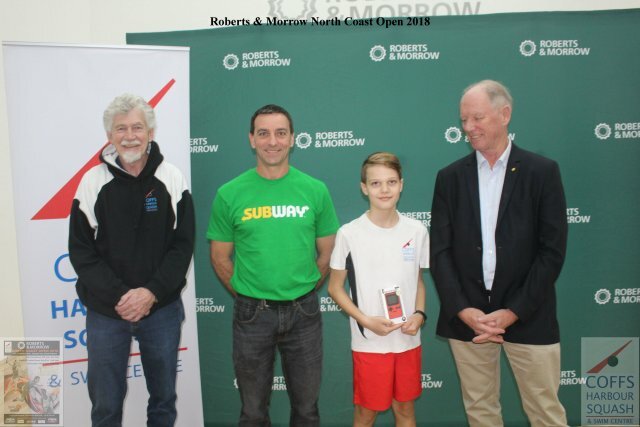 Dimitri continued a similar pattern of taking Evan to the front in the third and fourth games as Evan found difficulty in keeping any ball consistently to length with Dimitri winning in four games. 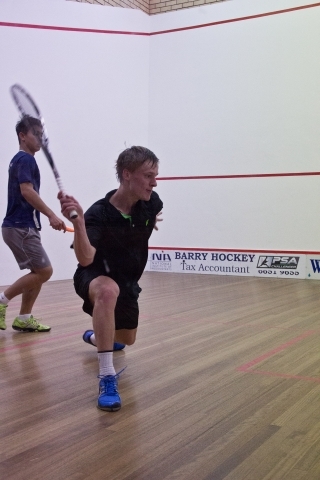 Dimitri stated after the finals “ Always tough playing Evan, but I have enjoyed my squash here this week. 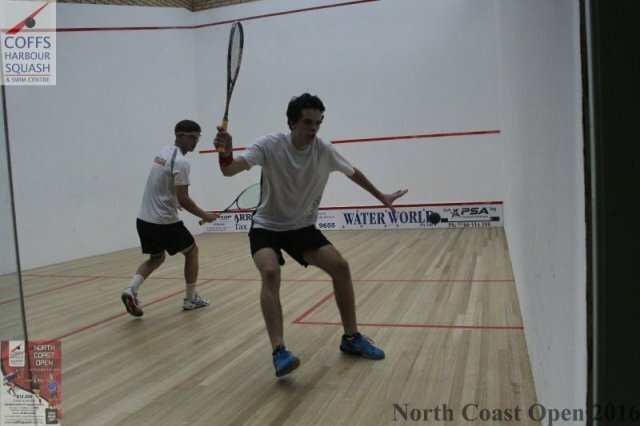 Exciting to get the win and off to Chicago in February”. 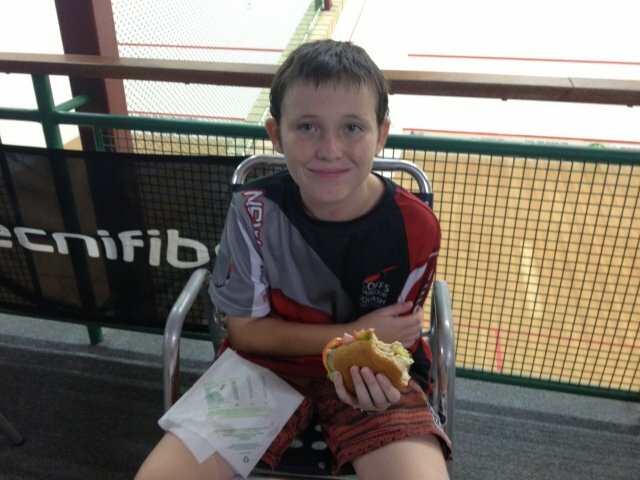 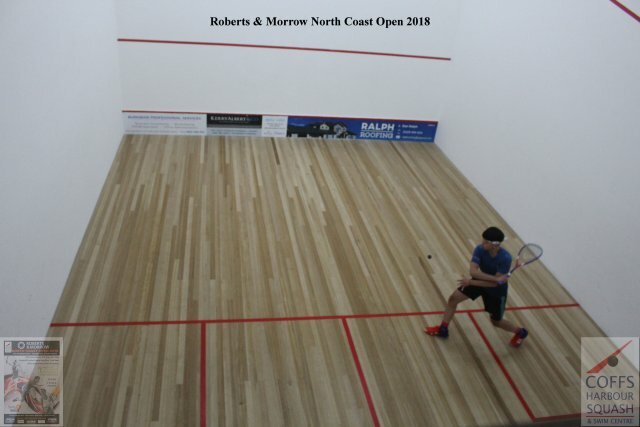 Evan Williams the No 2 seed playing for the first time here in Coffs Harbour put in a very solid performance against Asyraf Azan with minimal errors frustrating his opponent and emerge with a straight games win. 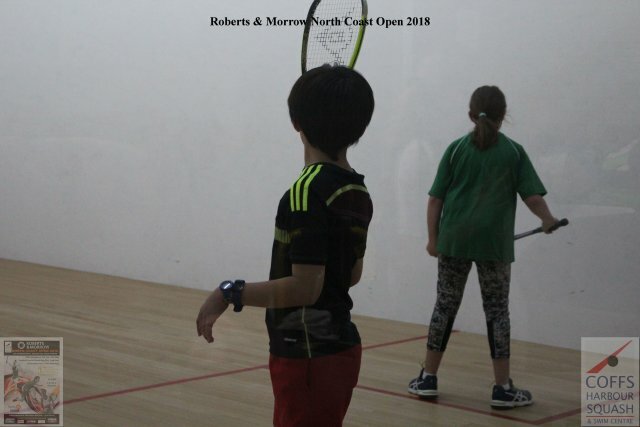 The final should be a great contest with both the top seeds through and vying for a spot in the World Championships 2019. 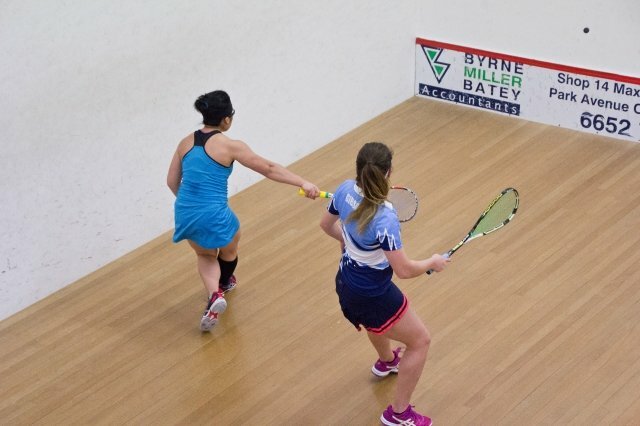 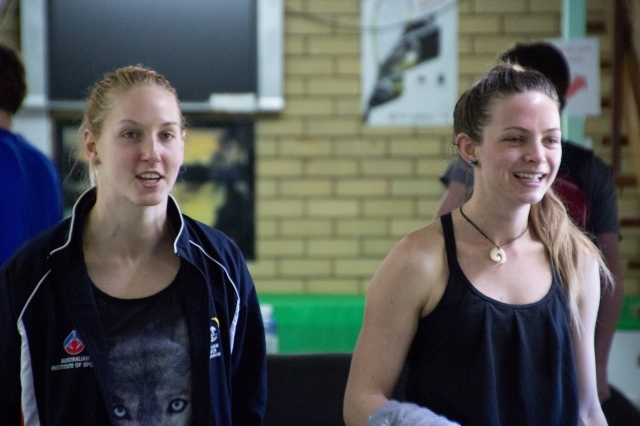 The first semi-final between Christine Nunn and Tamika Hunt came to an early end with Hunt conceding in the third game with injury. 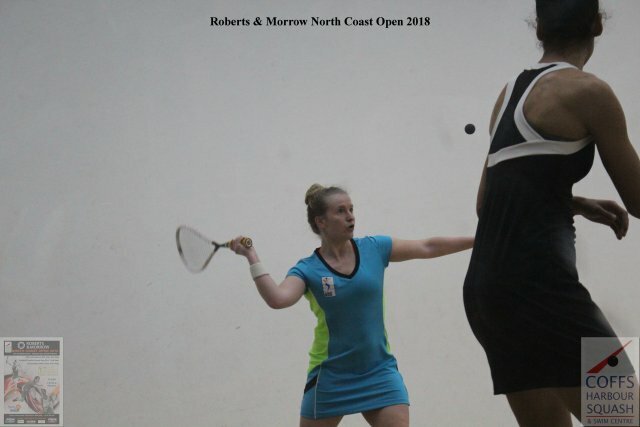 In the other semi-final Sarah Cardwell and Jessica Turnbull both produced some great drives and volleys early with Sarah winning the vital closing points to take the first game. 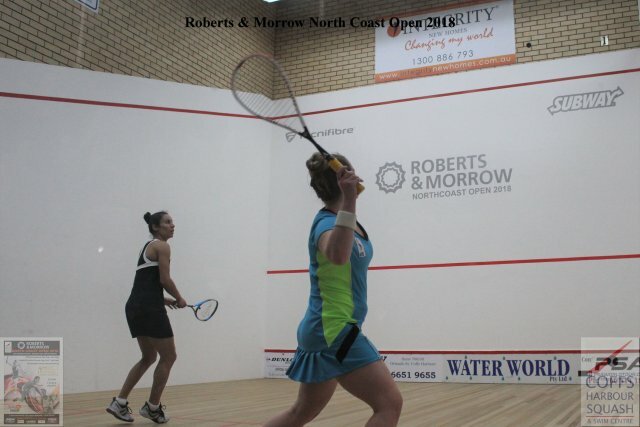 Jessica came out stronger in the second taking advantage of great volley drives to level the games at one all. 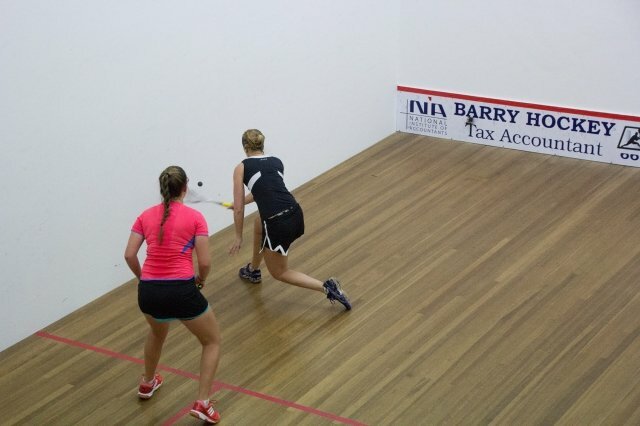 In the third and fourth games Sarah used the high ball to stem Jessica’s attack to the backhand. 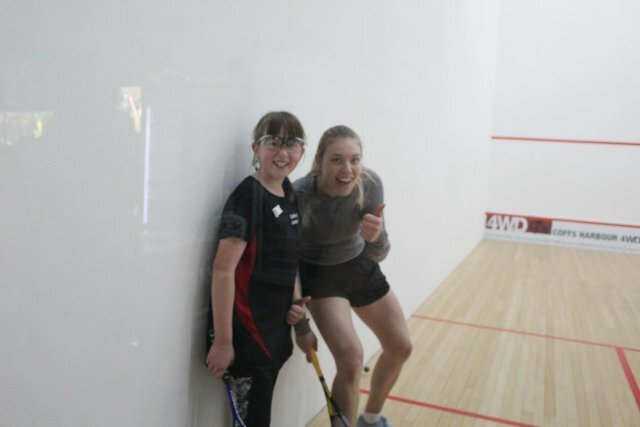 Sarah Cardwell has moved into the Finals after a strong performance against Jessica Turnbull and After the match stated “Really glad to get the win today especially as last time I was 2-0 up and lost in 5. 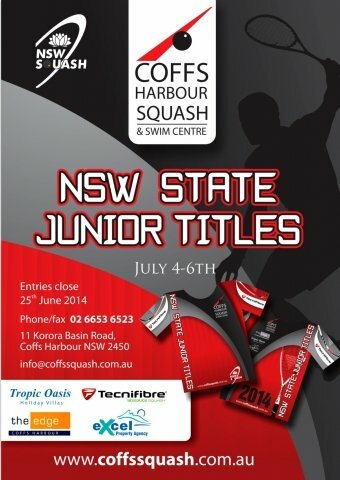 Looking forward to tomorrow, excited to battle for a title and a spot in the World Championships! 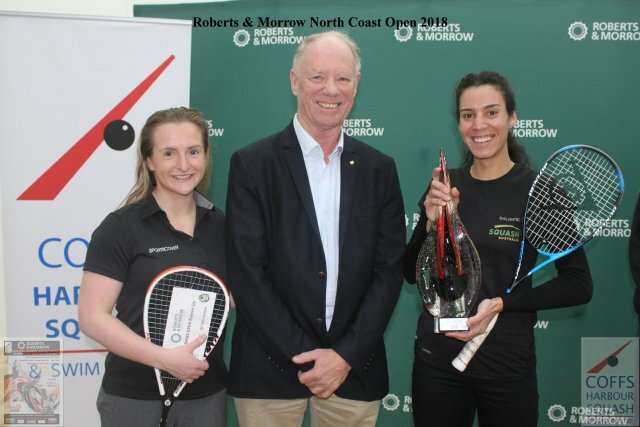 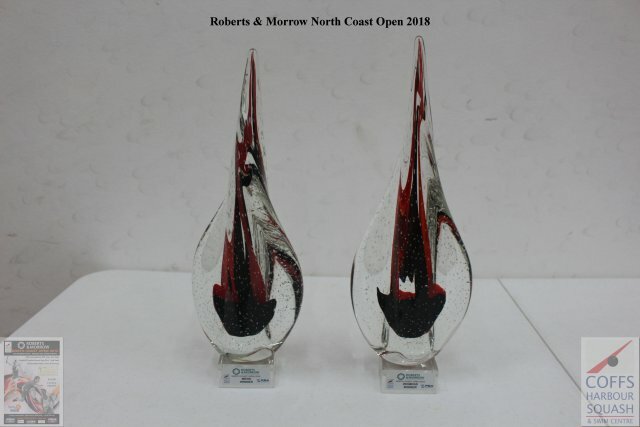 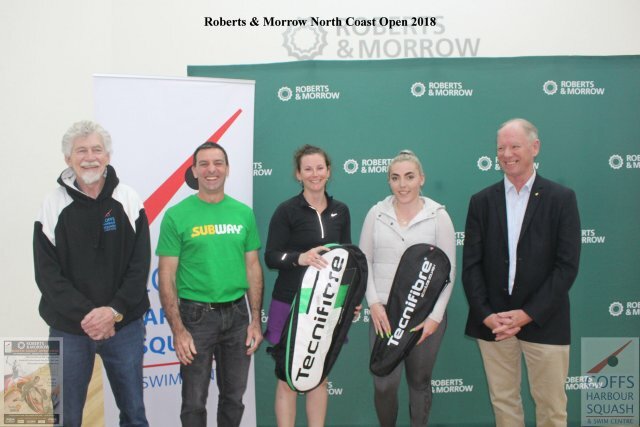 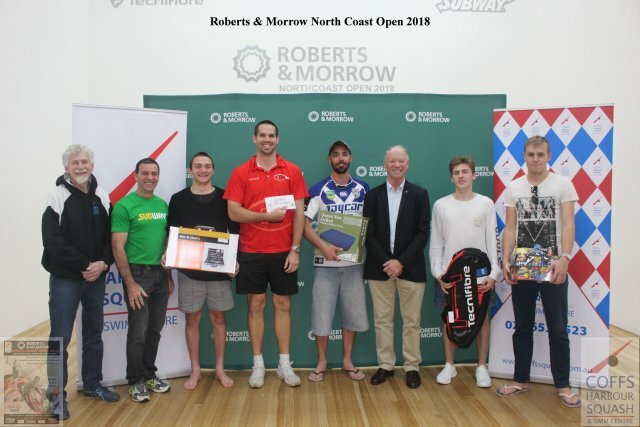 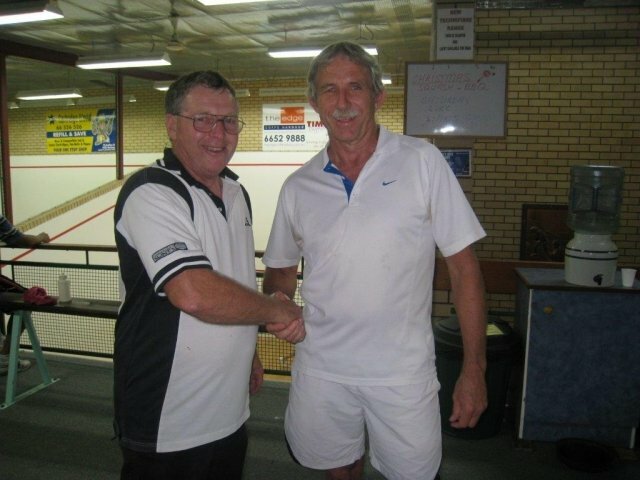 City Mayor welcomes all the players to Coffs Harbour for the Roberts & Morrow North Coast Open. 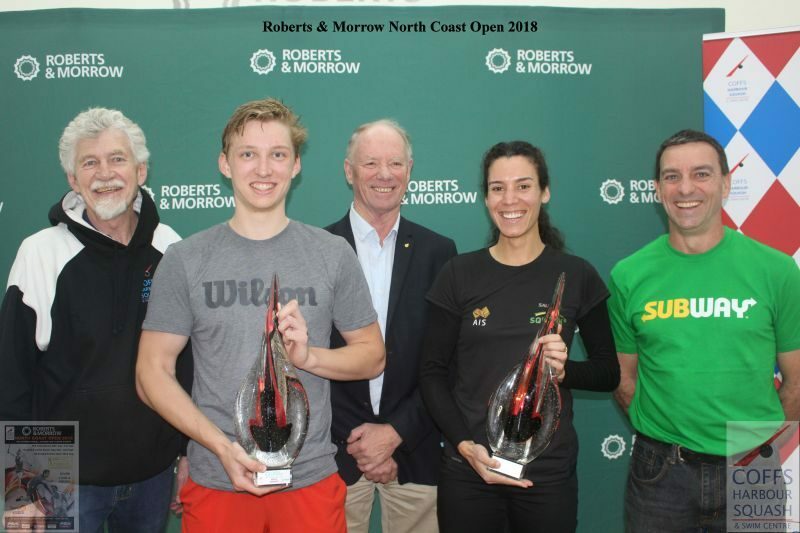 Mayor Denise Knight was delighted to welcome the international players and visitors to the city of Coffs Harbour and congratulated the Tournament Committee for hosting such a great event. 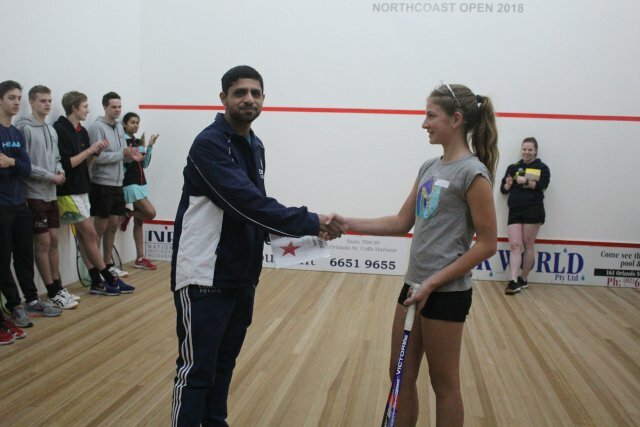 Extending best wishes to the players for the competition she encouraged them to take in the attractions of the city as a beautiful part of Australia. 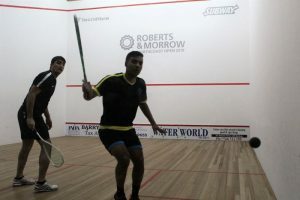 There were plenty of upsets tonight with some great performances by players as five seeds bowed out to eager opponents seeking a spot in the Quarter Finals and a step closer to a chance at winning the event and a invitee place for the World Championships in February 2019. 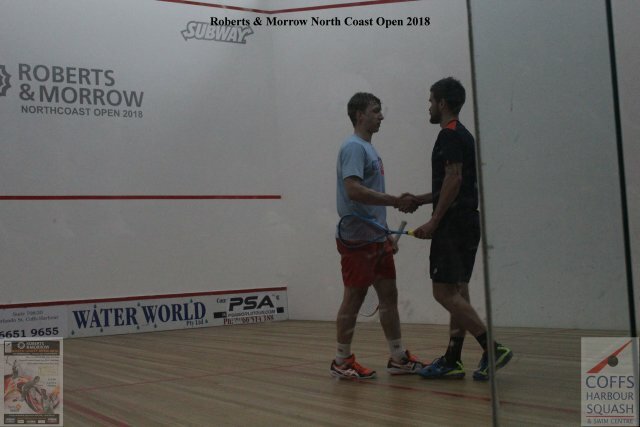 Getting proceedings started first up match between defending champion and No 1 seed Dimitri Steinmann Switzerland had to overcome a vastly improved Ruan Olivier South Africa. 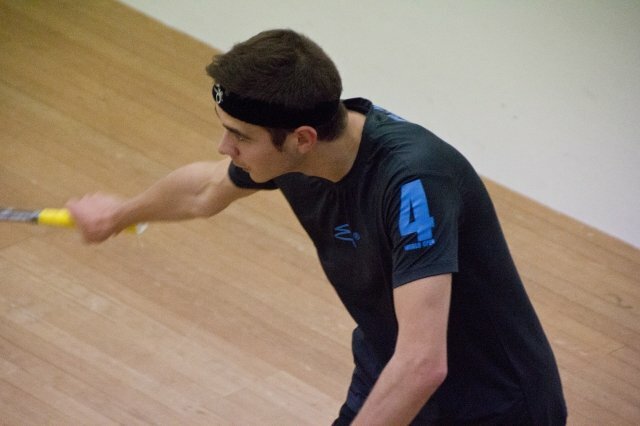 Olivier took the challenge right up to the top seed leading in the opening two games and forced the second game to a tie break before Steinmann took advantage of two errors to go two games up. 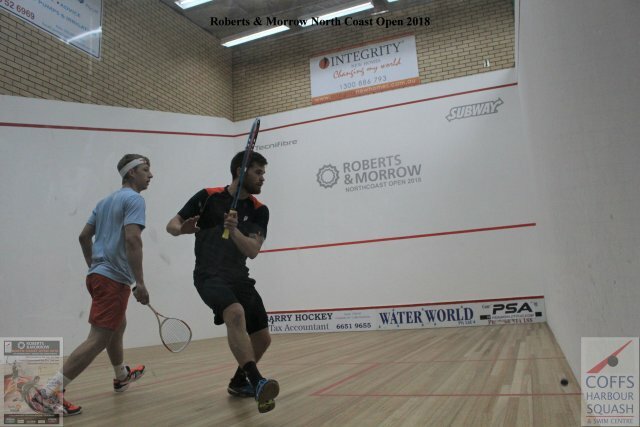 The third game saw both players raise the consistency with Steinmann changing the pace to gain the opening break at 9/8 as Olivier erred to give Steinmann the match in straight games to advance to the quarter finals. 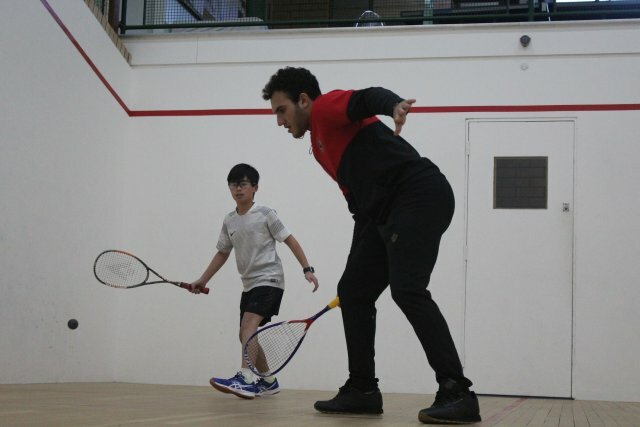 The match between Naoki Hayashi JPN and Bryan Lim Tze Kang MAL provided an upset with Hayashi continuing his great form coming from two games down to emerge victor in five games over the No 5 seed. 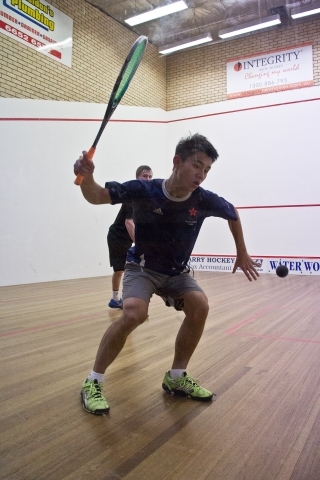 Naoki now advances to the quarter finals where he will meet Asyraf Azan for a place in the semi-finals. 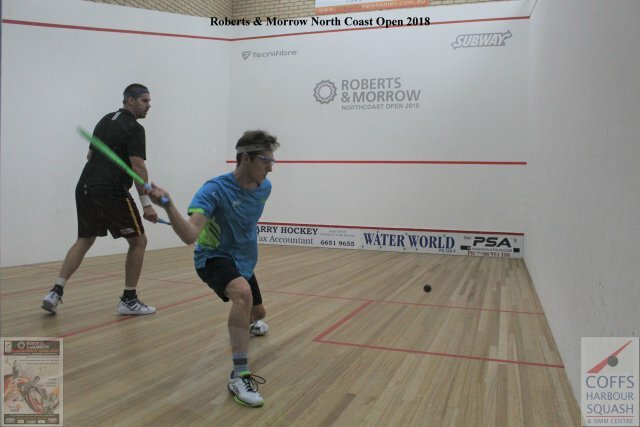 Rohan Toole AUS continues to upset the seedings defeating No 4 seed Scott Galloway NZL in four games. 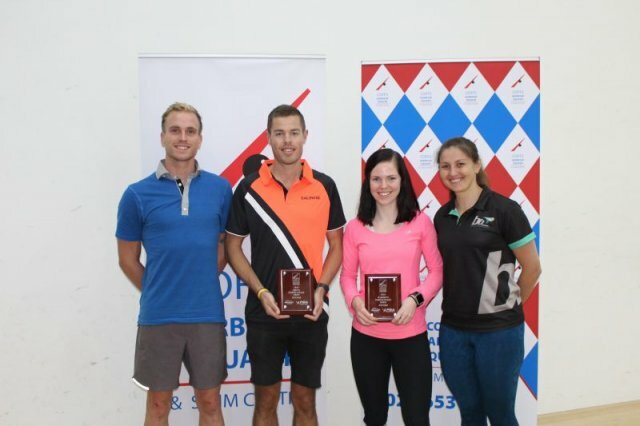 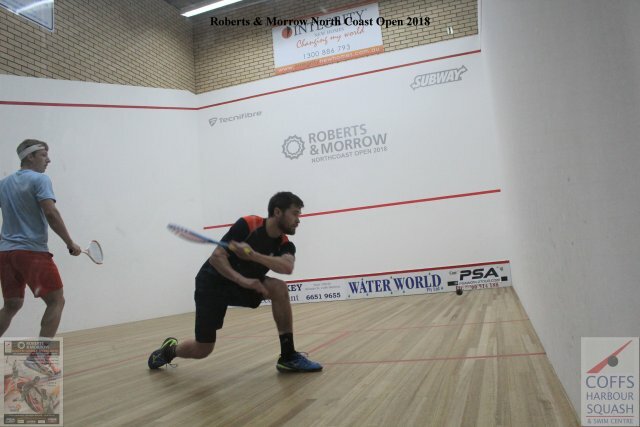 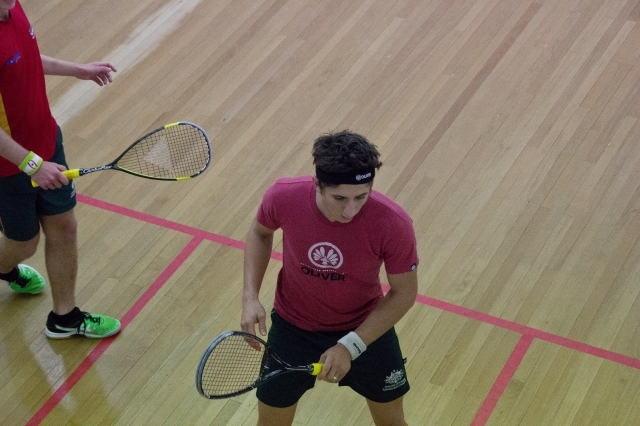 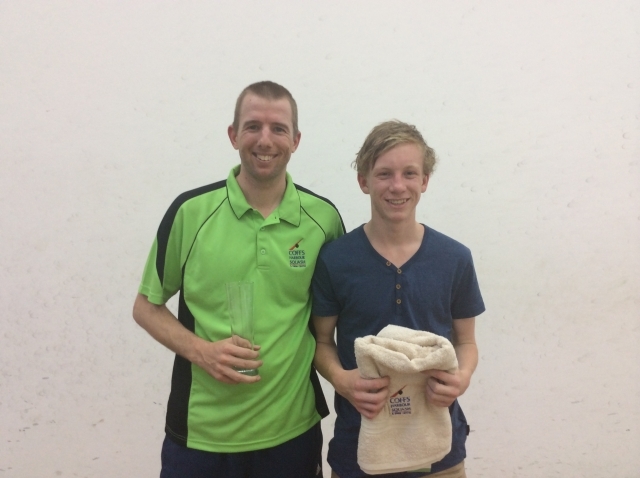 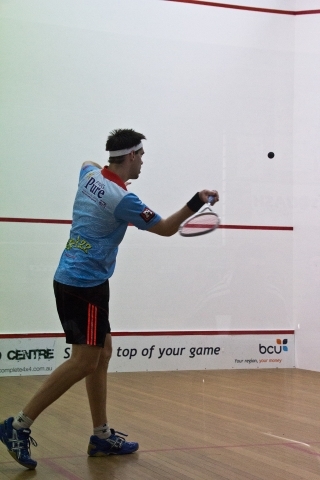 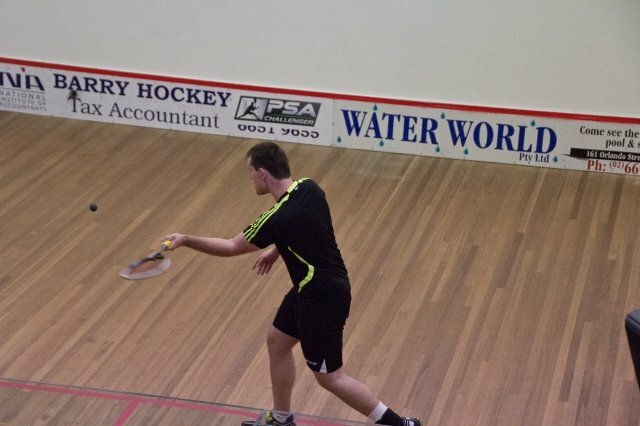 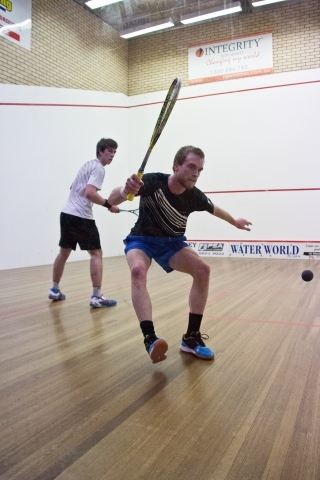 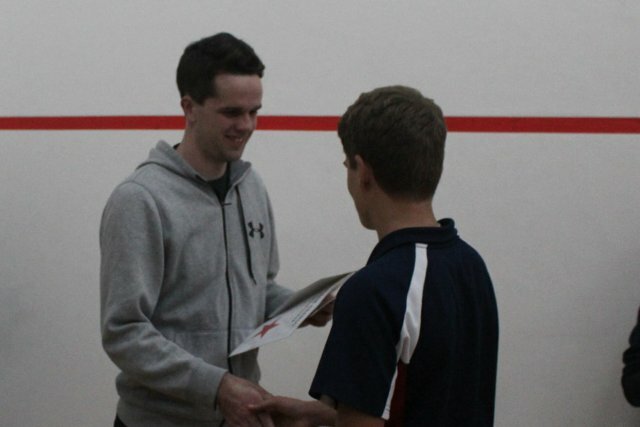 Toole produced some good performances at the recent Shepparton International and will now face Nicholas Calvert who also defeated the No 8 seed, Thomas King CAN with the winner to secure a semi-final place. 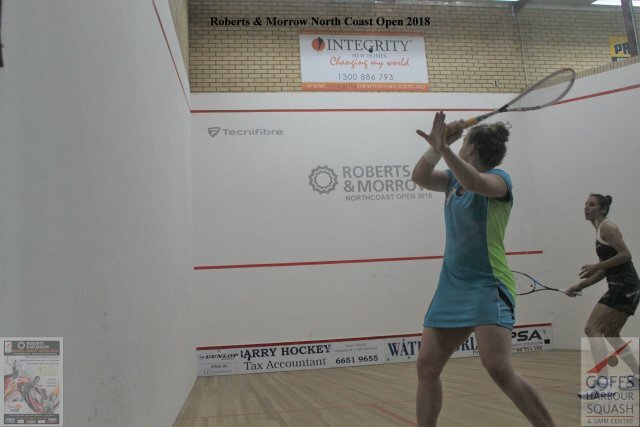 The Quarter Finals opened with No 1 seed Christine Nunn AUS against Taylor Flavell AUS with Nunn showing her speed to control the game and pressure Taylor into error to record a comfortable win in straight games. 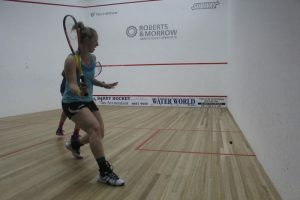 Jessica Turnbull No 4 seed dominated the front court against Courtney Mather for a 3/0 win to advance to tomorrows semi-final against No 2 seed Sarah Cardwell. 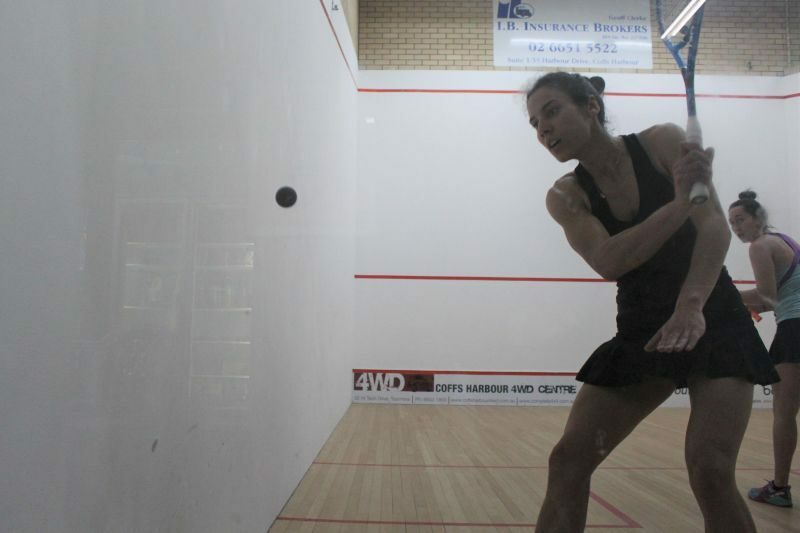 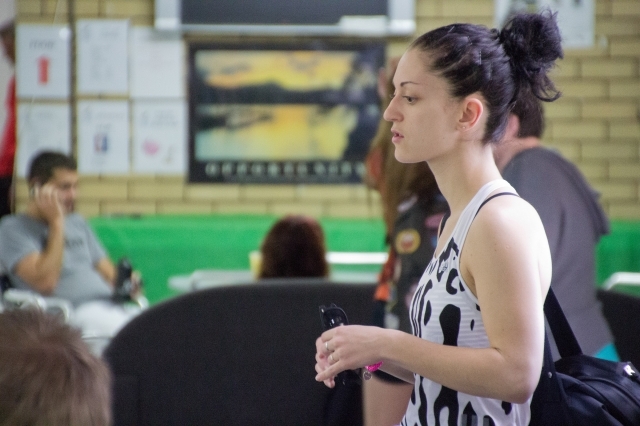 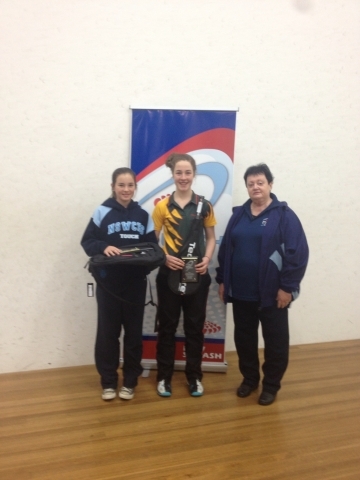 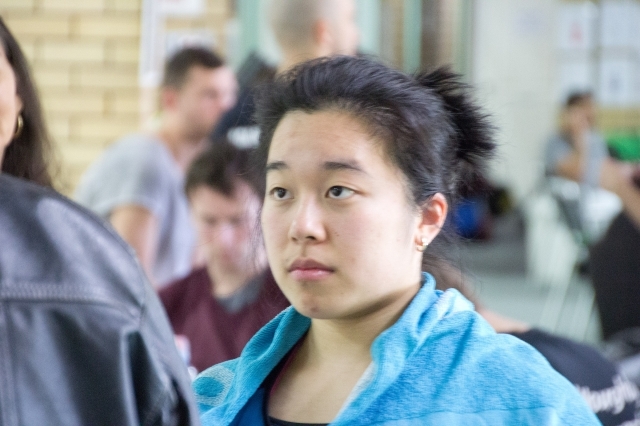 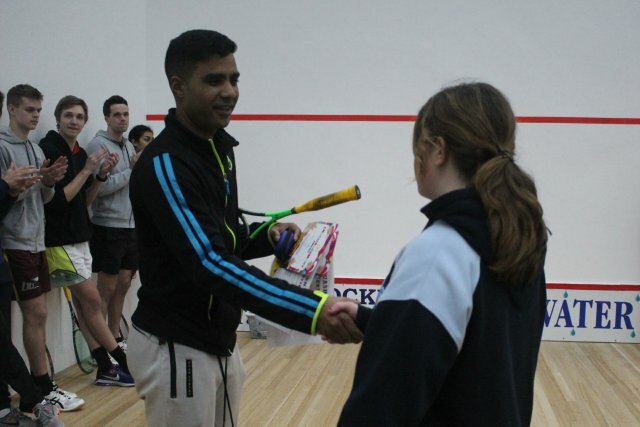 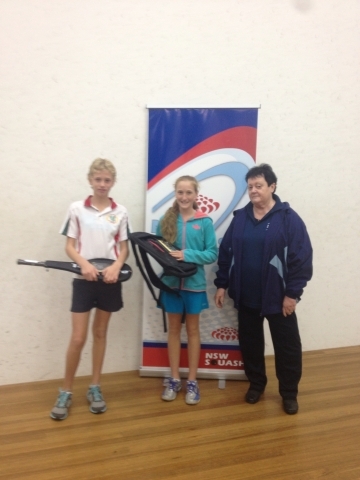 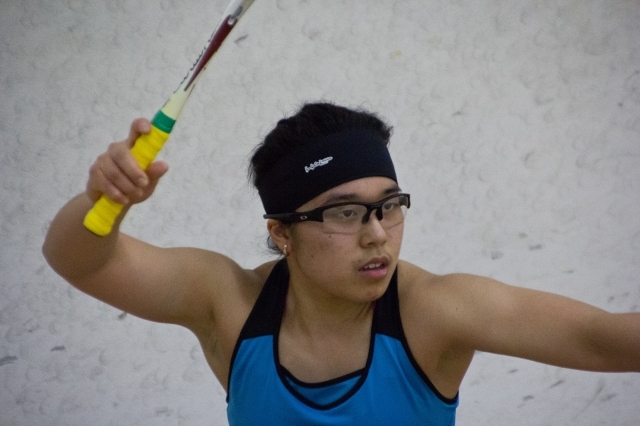 Cardwell had earlier defeated Selena Shaikh to secure her Place in the Semi-final against Turnbull. 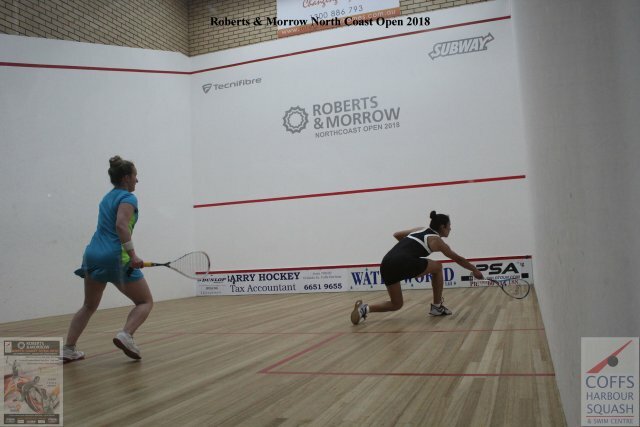 First Round action of the Women’s Open started this morning with an unfortunate injury to PNG player Lynette Vai early in the first game causing her to withdraw from the match against Shehana Vithana AUS. 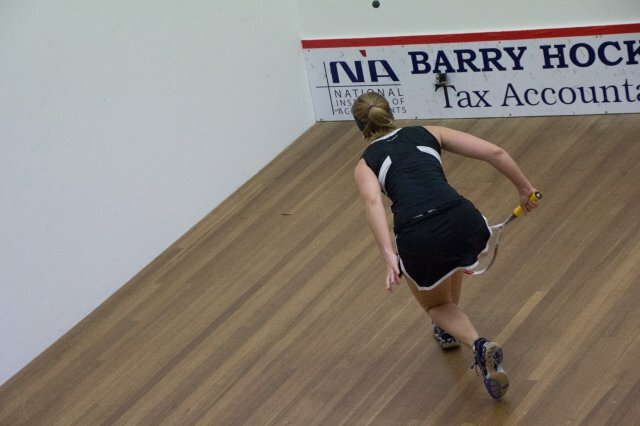 In other action Jessica Turnbull AUS 4th seed, saw off a very determined Chiao-Chi Lin of Taipai. 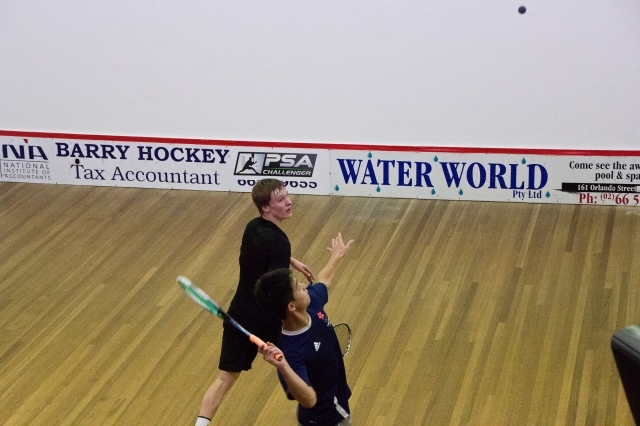 The scoreline didn’t reflect the challenge put up by Chiao-Chi who volleyed exceptionally well as the match progressed. 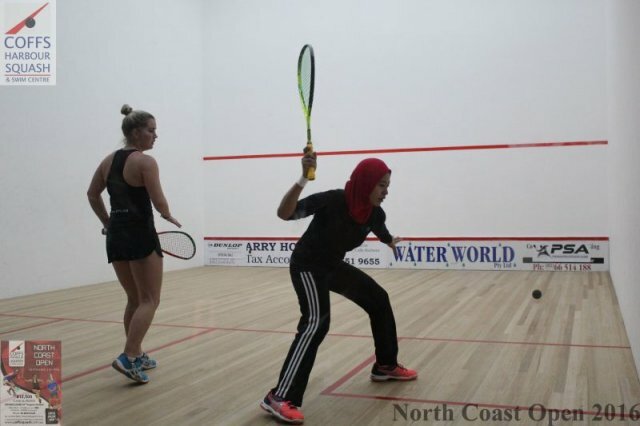 In the match of the round Selena Shaikh AUS defeated Challen Stowell AUS in a five game thriller to advance to tonight’s Quarter Final stage where she will meet No.2 seed Sarah Cardwell AUS. 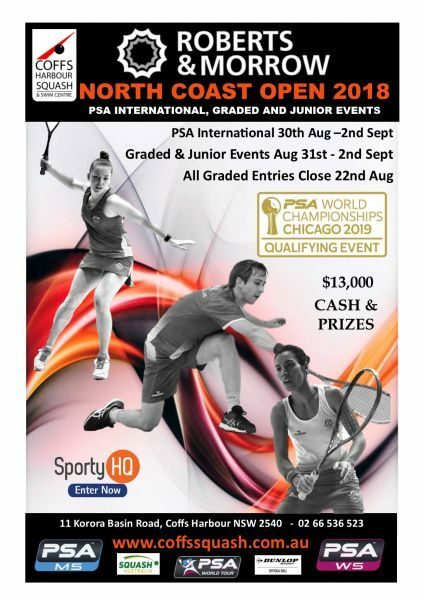 Play got underway tonight in the PSA Challenger 5 Tour Qualification Event for the World Championships Chicago 2018/19. 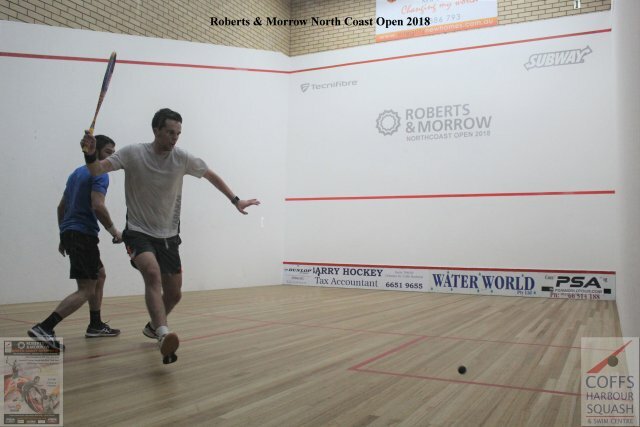 First up action between Benjamin Ratcliffe AUS and Ruan Olivier RSA set the stage for good contests with Olivier quick to punish any short ball early. 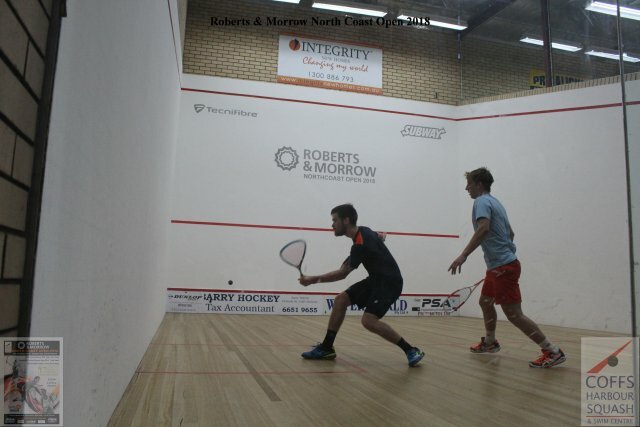 Ruan maintained pressure to the corners cutting off Ratcliffe’s shots to run out a comfortable winner in three games. 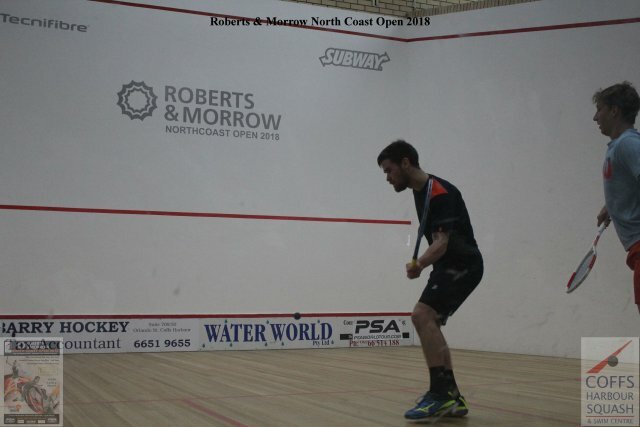 Next up was 9/16 Robin Gadola SUI against talented U/19 Australian Jacob Ford who surprised his more experienced opponent coming from behind at 8/6 to draw level at 10-10 forcing the first game to a tie break before Gadola was able to clinch the important game 13/11. 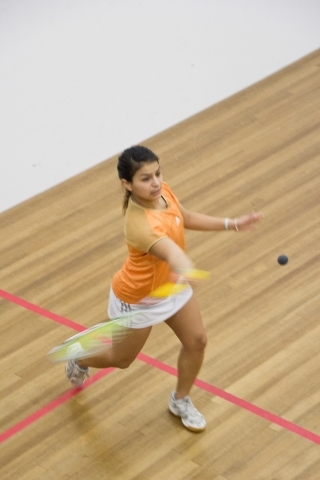 Gadola started to control the centre court better in the second and third games to advance to tomorrow second round. 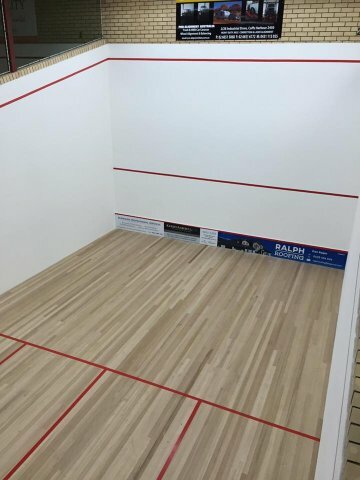 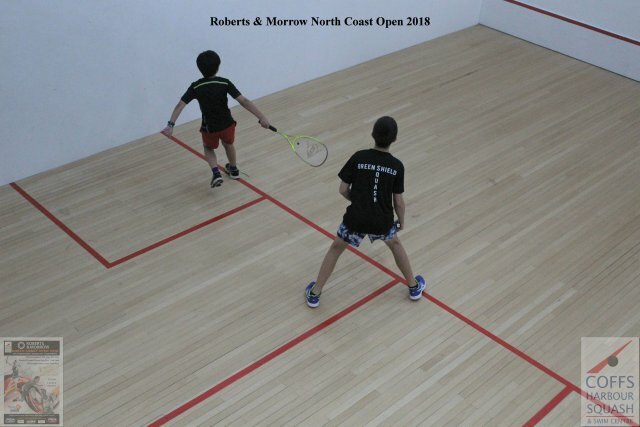 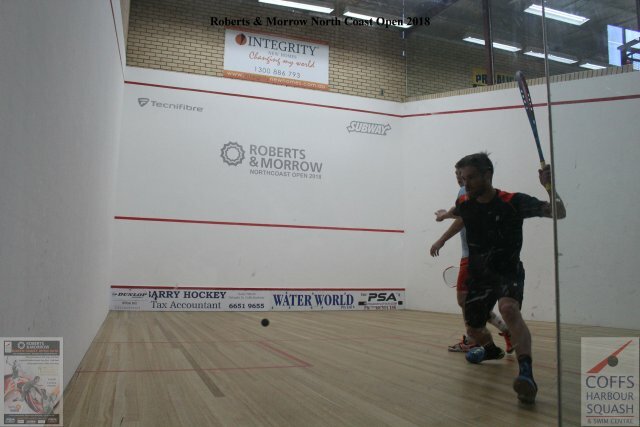 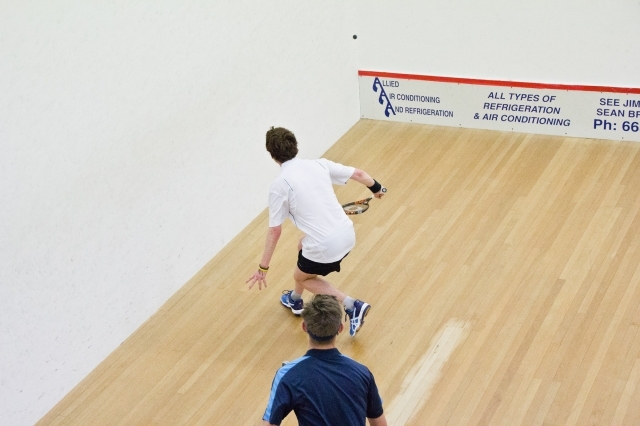 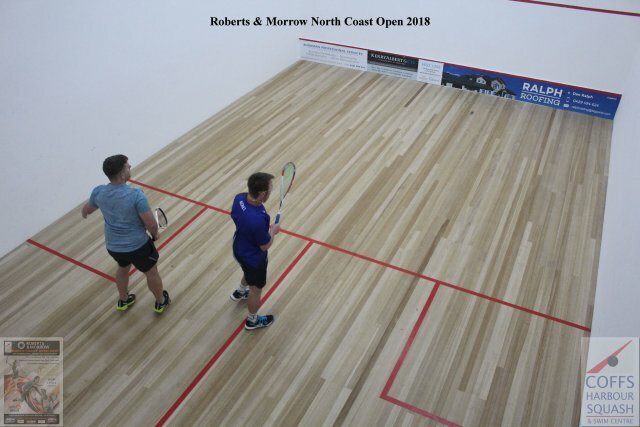 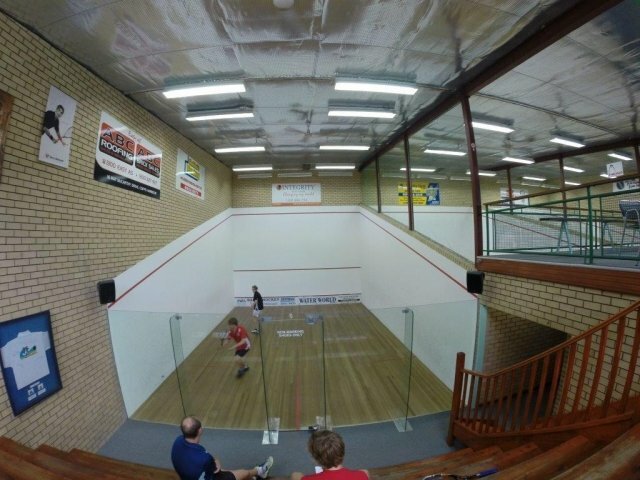 Players have appreciated the tremendous playing surface at the Coffs Harbour Squash Centre as shown by Courtney West AUS against Shahzad Khan AUS who produced plenty of shots but unfortunately wasn’t able to break the consistency of West who went on to win in straight games. 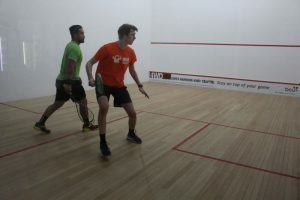 Asyraf Azan MAS produced plenty of shots in his match against Madison Eggert to upset his opponent in three games and advance to the second round where he now meets Number three seed Thomas Calvert of Australia. 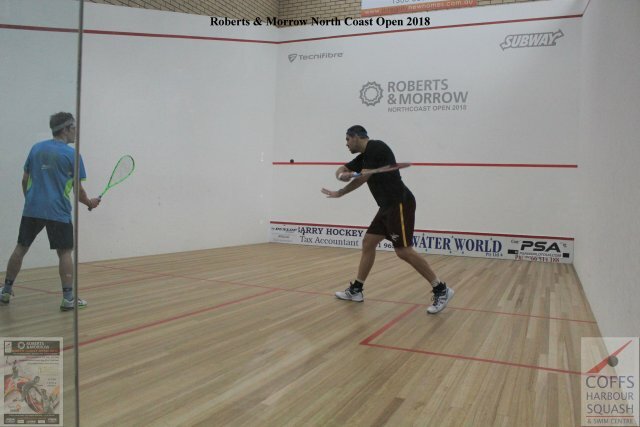 The final match between Naoki Hayashi JPN and Abdelrahman Abdelkhalek EGY saw the leftie Naoki show his class with plenty of control as he felt at ease on the backhand court and tighter placement saw him through to the second round comfortably. 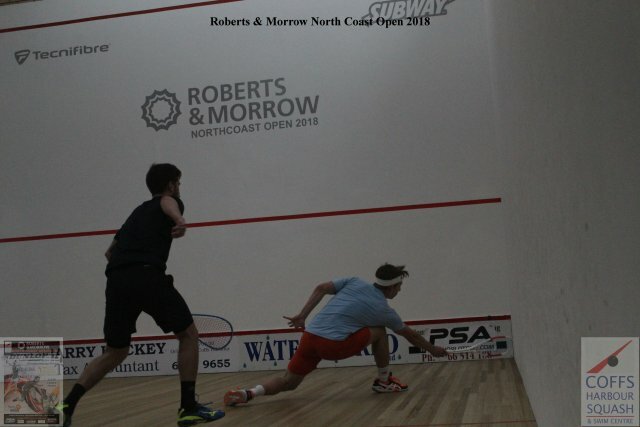 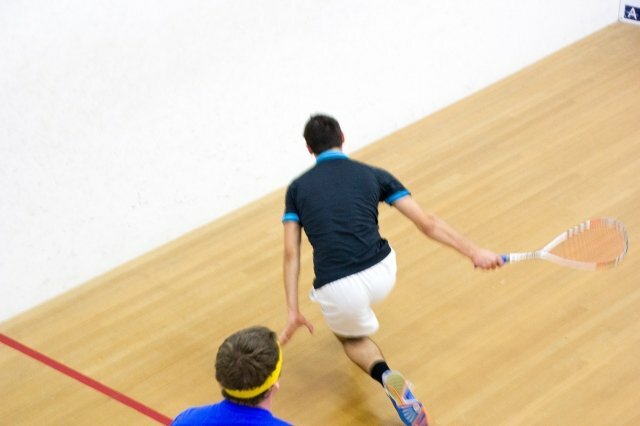 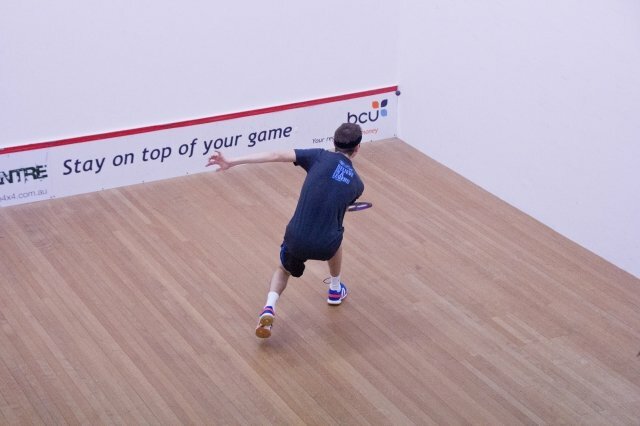 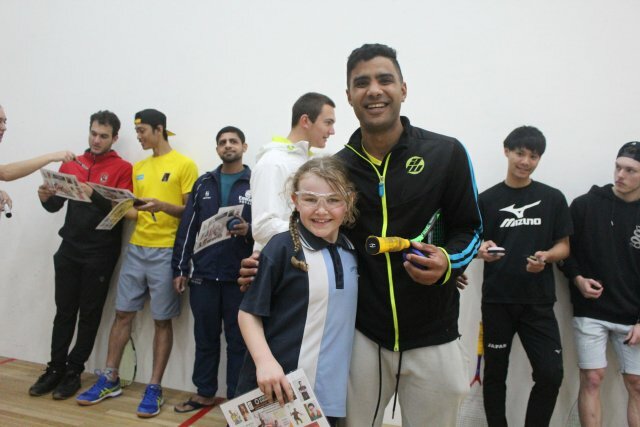 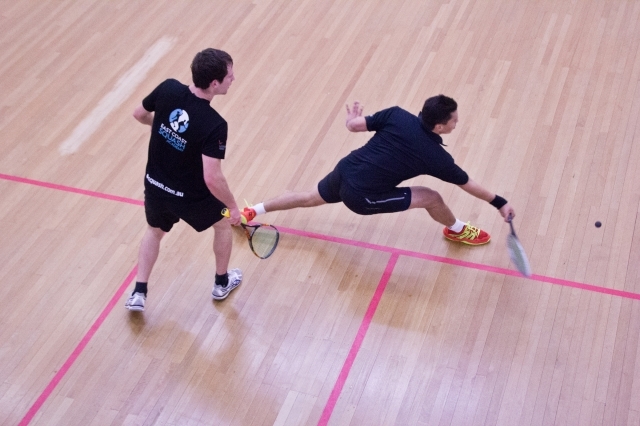 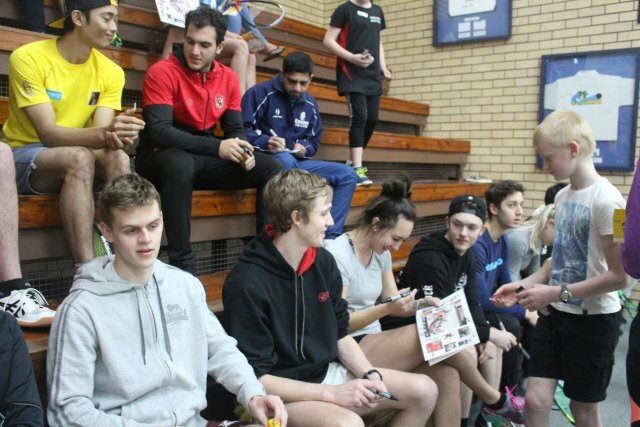 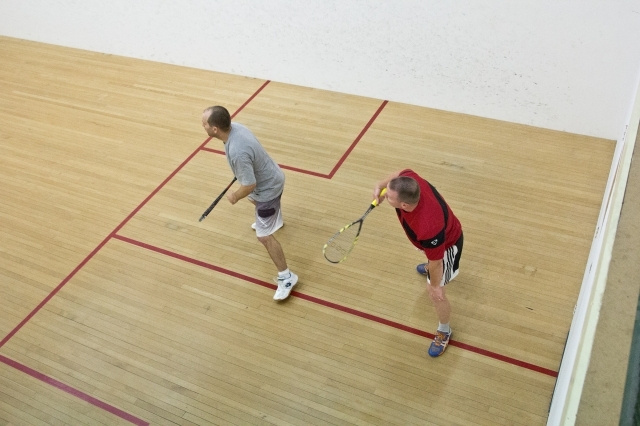 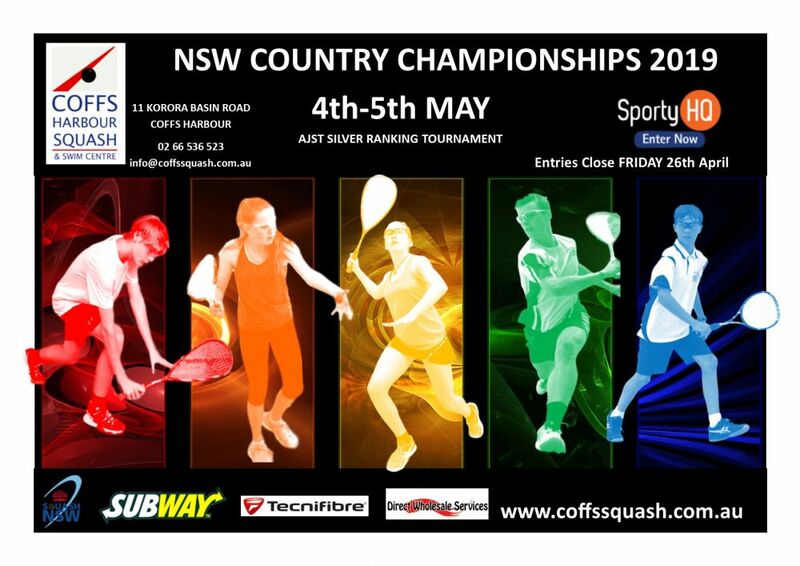 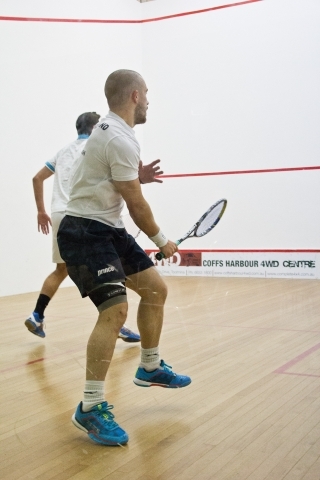 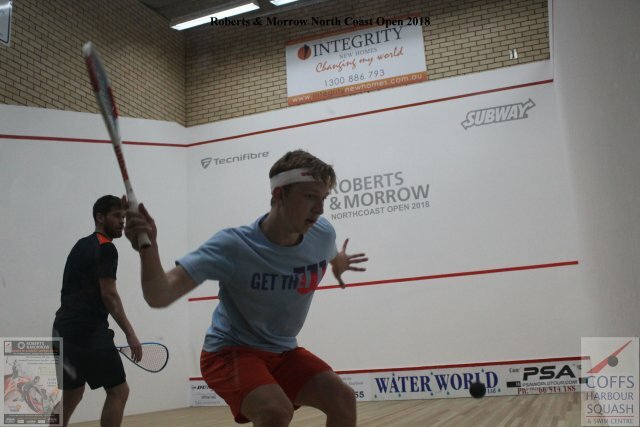 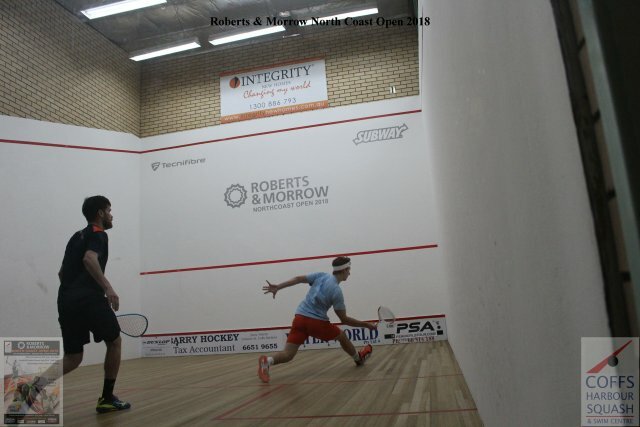 Play commences on Thursday with the first round of fixtures set to get underway from 6.00pm at the Squash Centre with 16 players competing for a spot in the second round on Friday Night in the PSA Challenger World Qualification Event for the World Championships 2019. 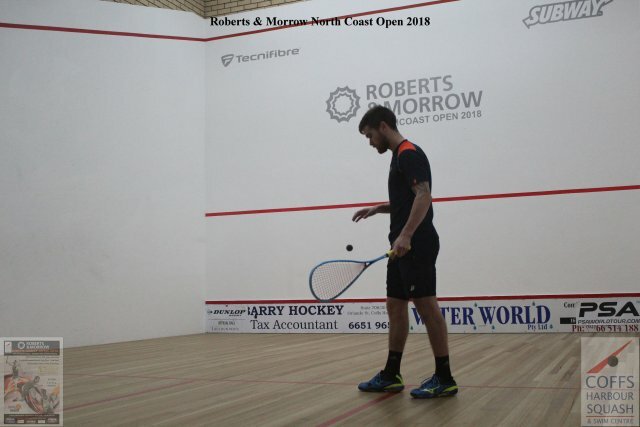 The players, many of whom are from overseas have been busy practising at the centre earlier this week and preparing for the event to get underway. 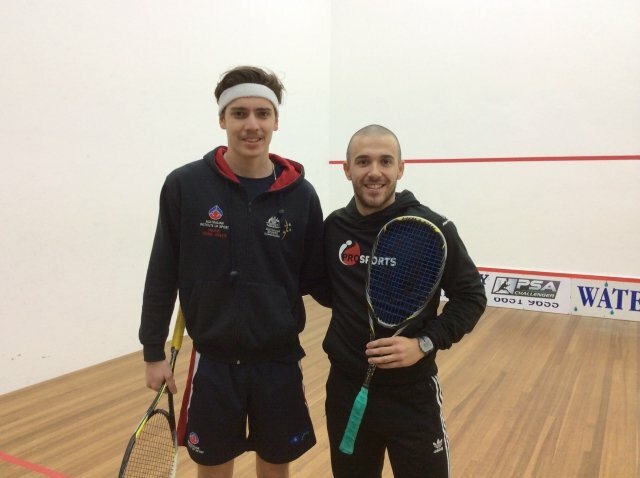 Among the early arrivals is Ruan Olivier of South Africa who is drawn to play one of Australia’s promising young players Ben Ratcliffe of Victoria. 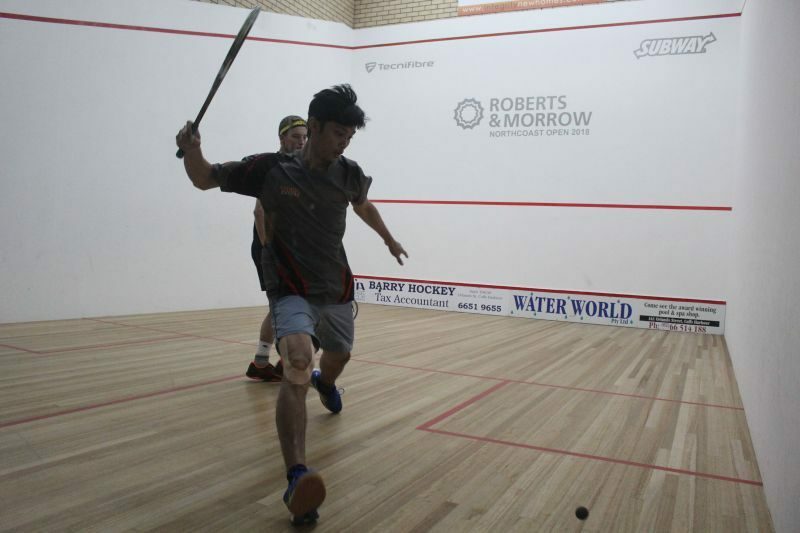 An all international match between Naoki Hayashi Japan and Abdelrahman Abdelkhalek of Egypt could be one to watch as Hayashi has been in good form reaching the semi-finals before losing to Evan Williams the No 2 seed at the Shepparton International last weekend. 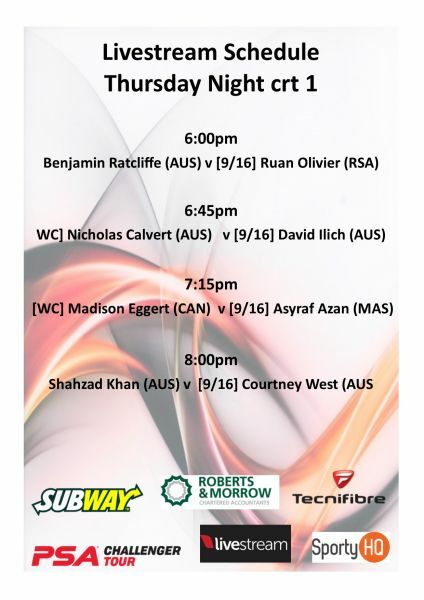 Local interest will centre on talented Under 19 player, Jacob Ford who has drawn Robert Gadola, Switzerland in his opening match. 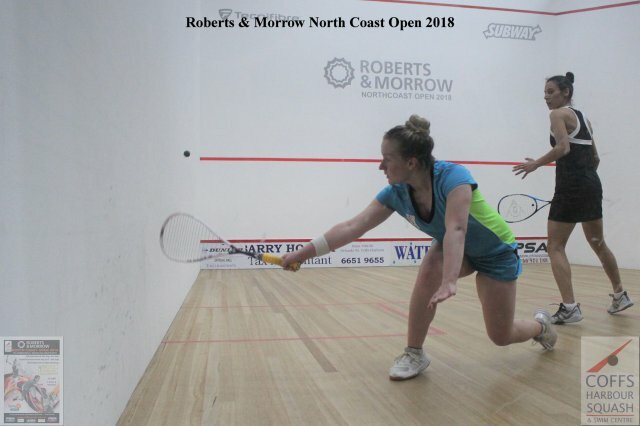 Gadola was a semi- finalist at Shepparton last week and is in good form, no doubt looking to go one further here in Coffs Harbour. 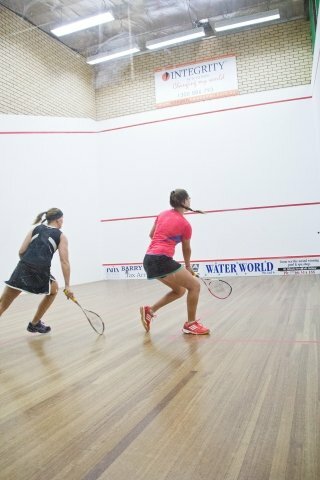 Members of the general public are welcome to visit the centre and see world class squash action with match schedule viewing times to see all the players in action throughout the weekend starting from Thursday night for the men and the women hit the courts early on Friday morning for their opening round.